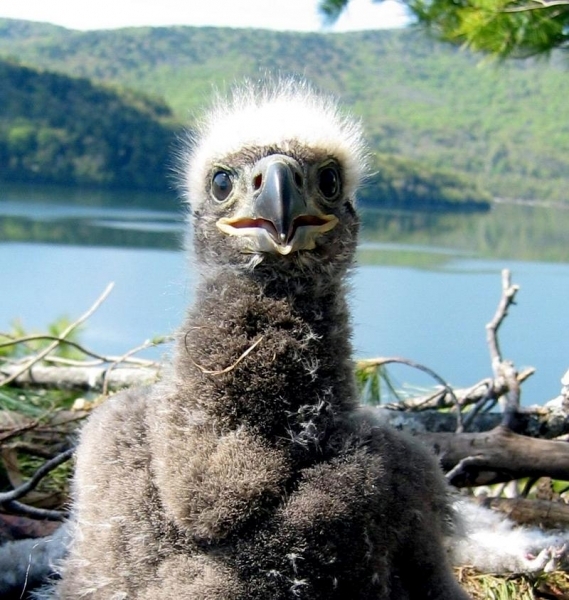 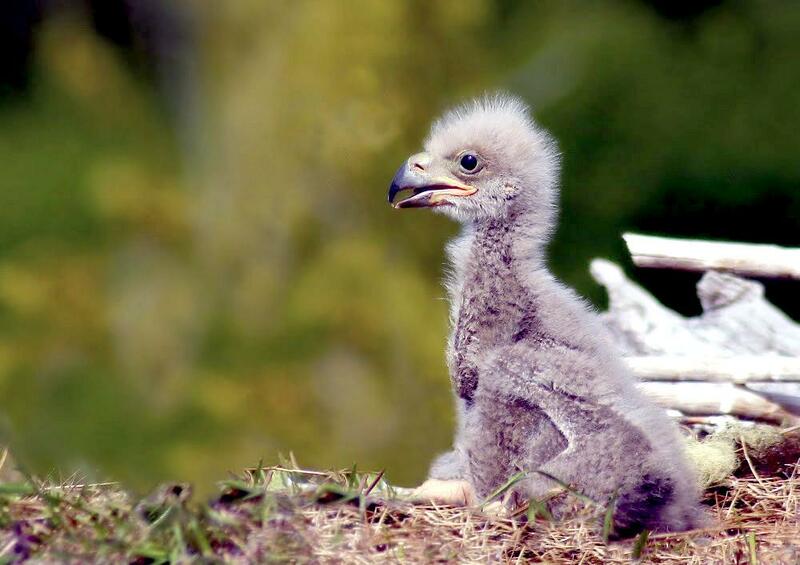 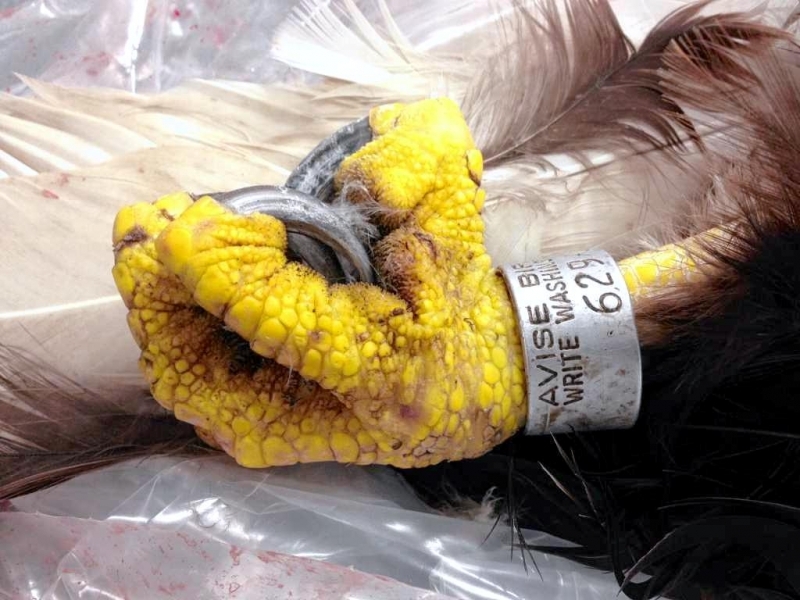 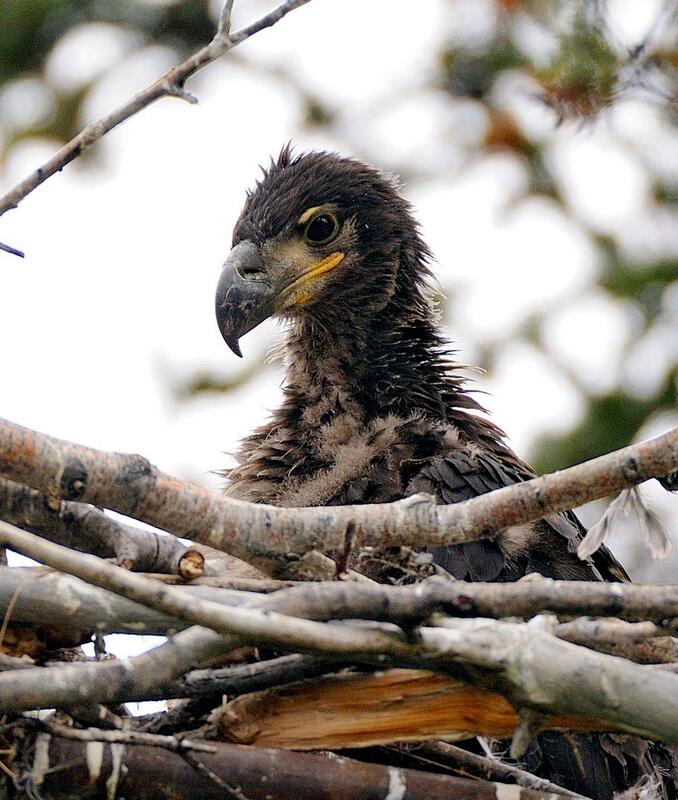 The only sea eagle living on the North American continent is the Bald Eagle, which is found across Canada and the United States and in northern Mexico. 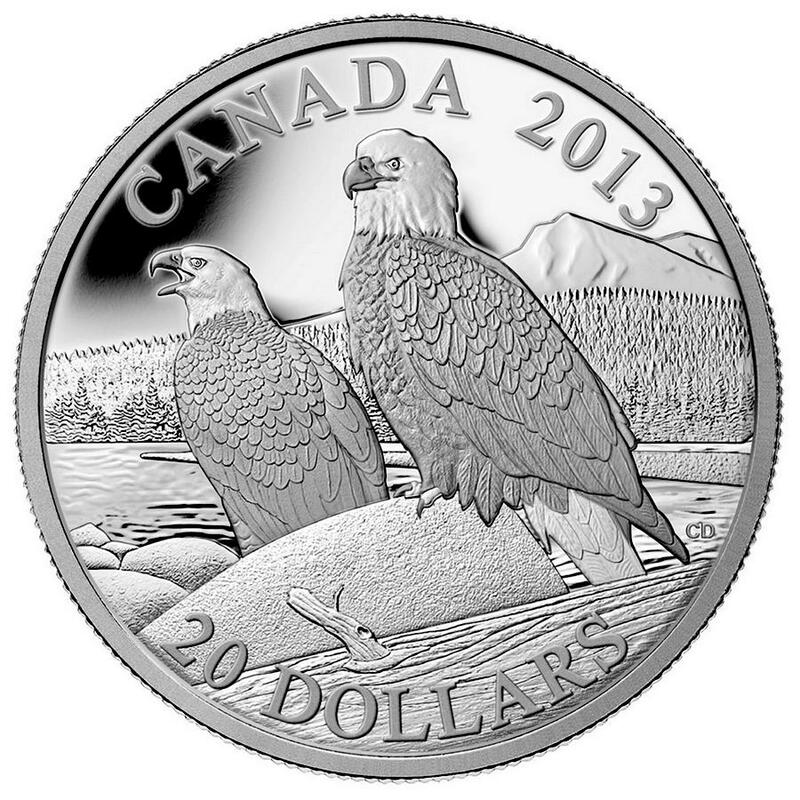 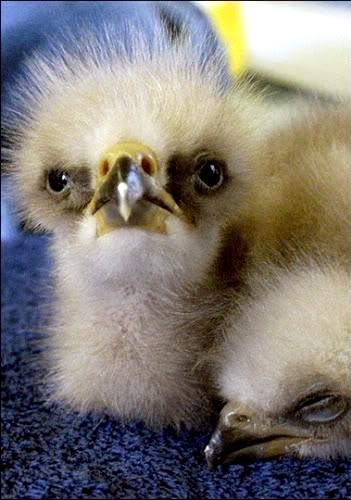 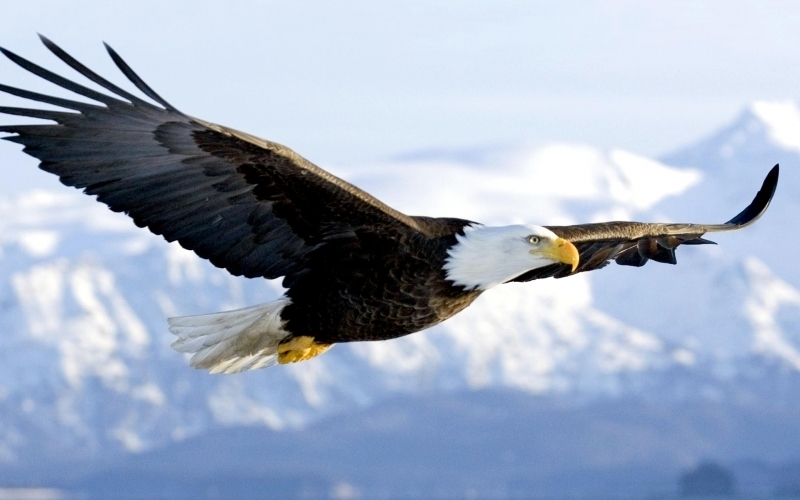 The Bald Eagle’s scientific name means “White-headed Sea Eagle”. 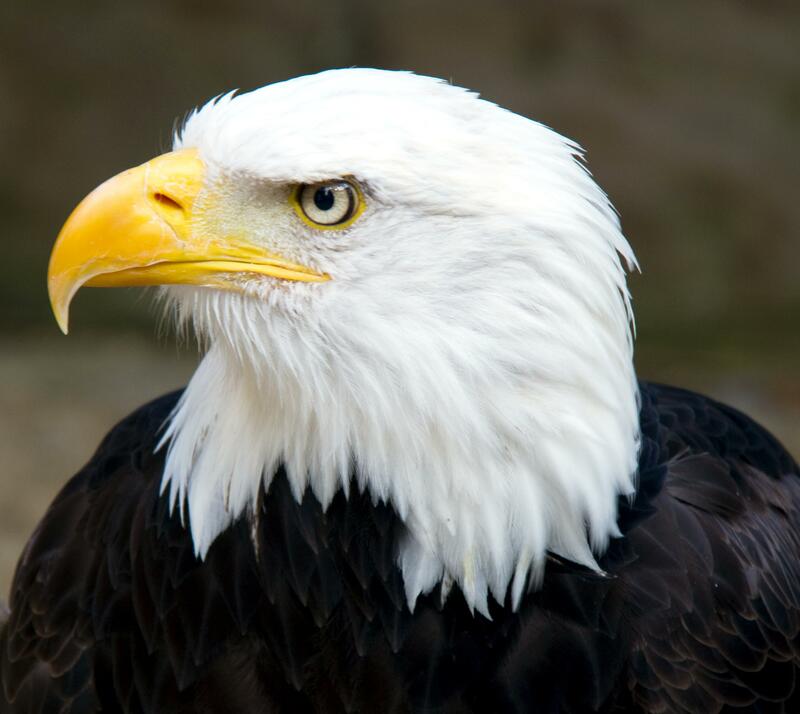 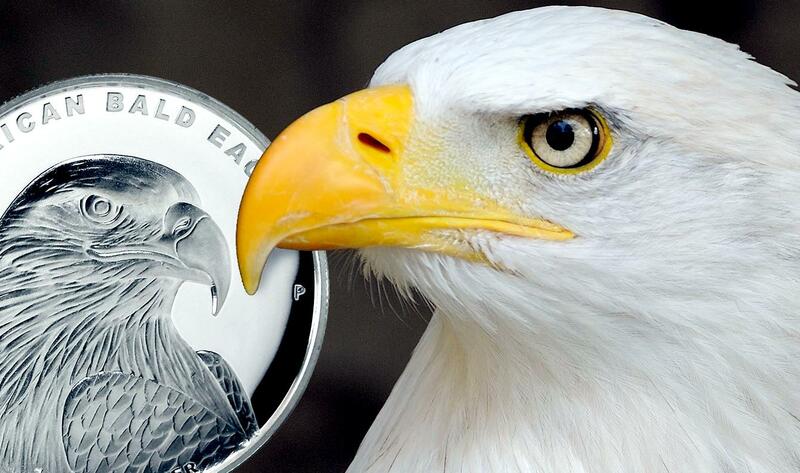 The Bald Eagle is the only eagle unique to North America. 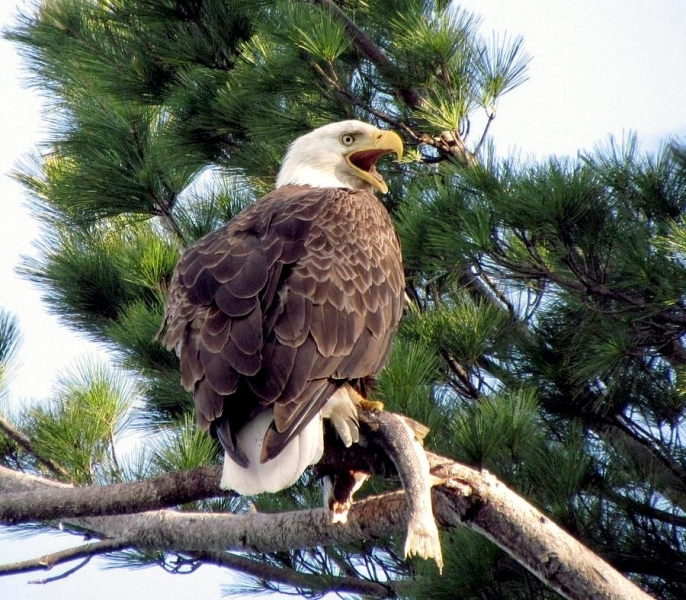 Its distinctive brown body and white head & tail make it easy to identify even from a distance. 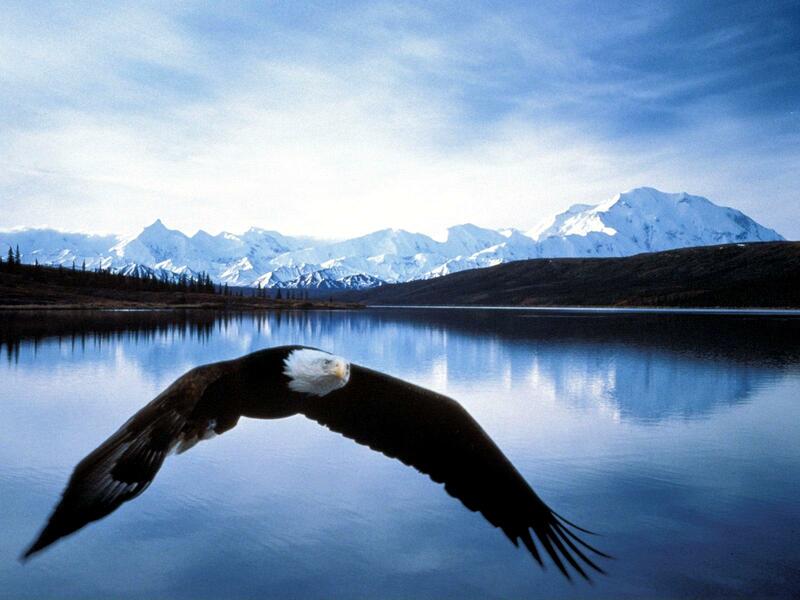 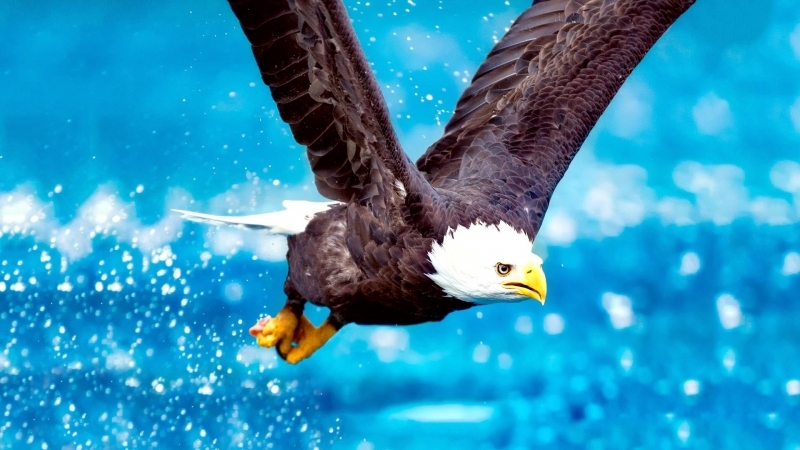 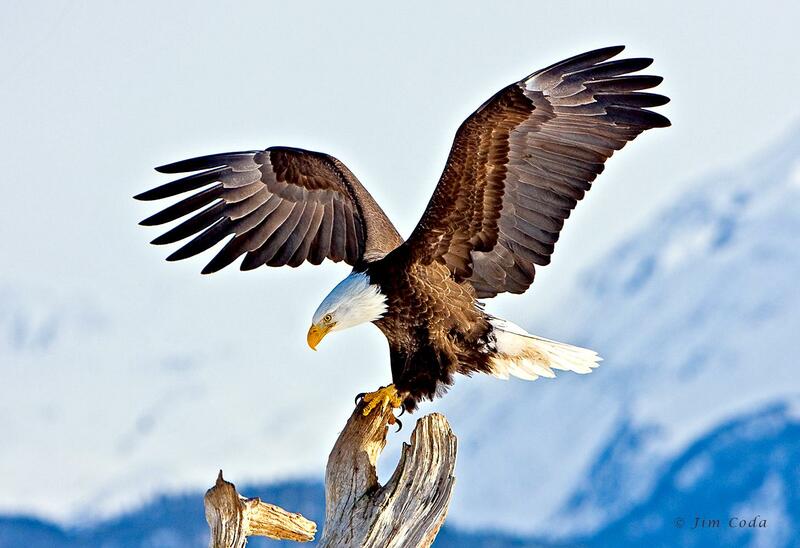 When flying, the Bald Eagle very rarely flaps its wings but soars instead, holding its wings almost completely flat. 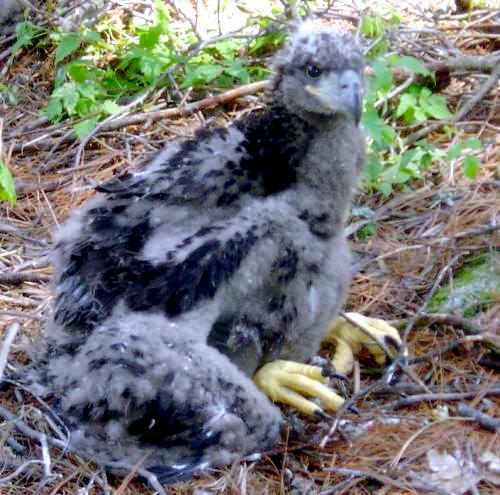 Its hooked bill, legs and feet are yellow. 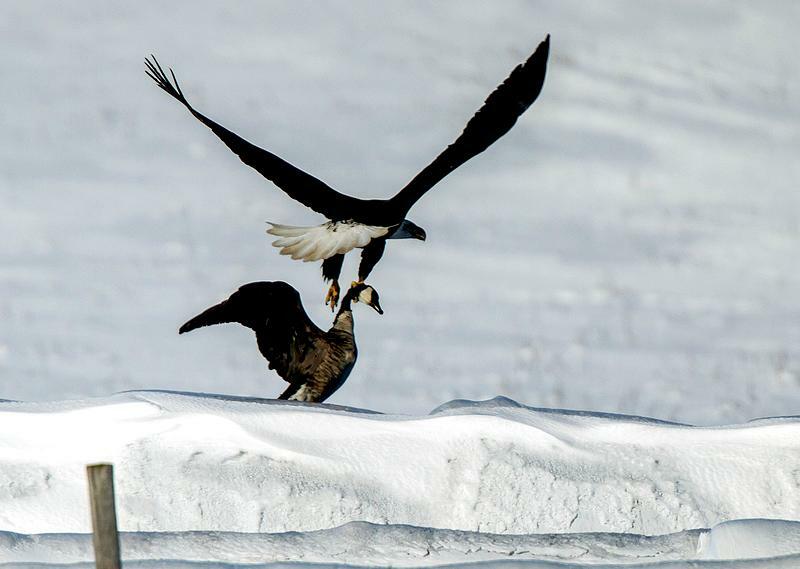 Second in size only to the California Condors and about the same size as the Golden Eagle, Bald Eagles dwarf most other North American raptors. 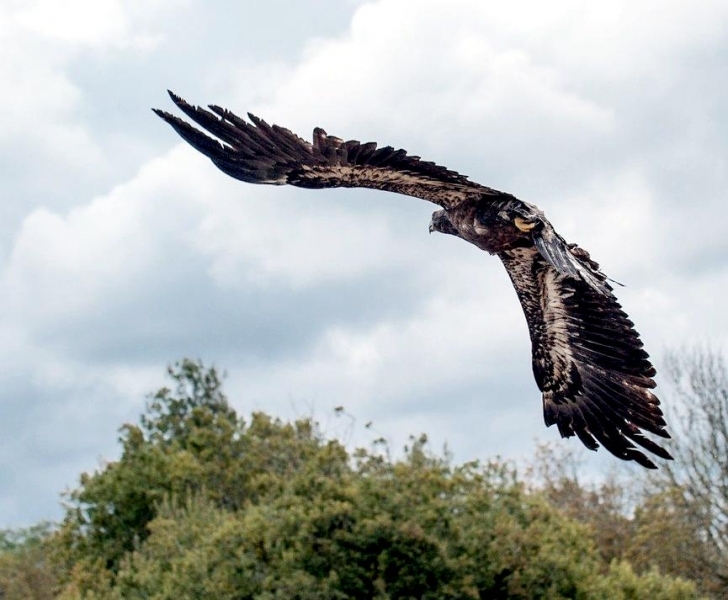 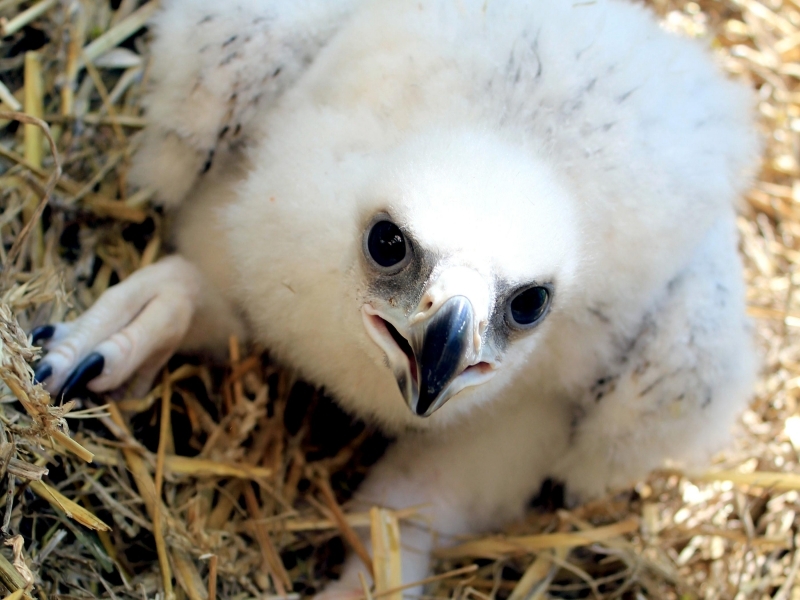 Their wingspans range from 6.5 to 7.5 feet, while body length varies from about 3 to 3.5 feet. 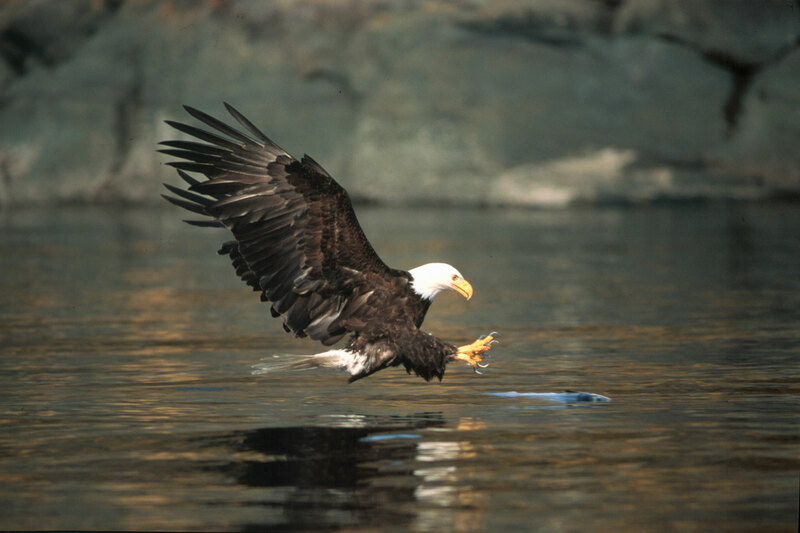 Bald Eagles weigh from 6 to 8 pounds. 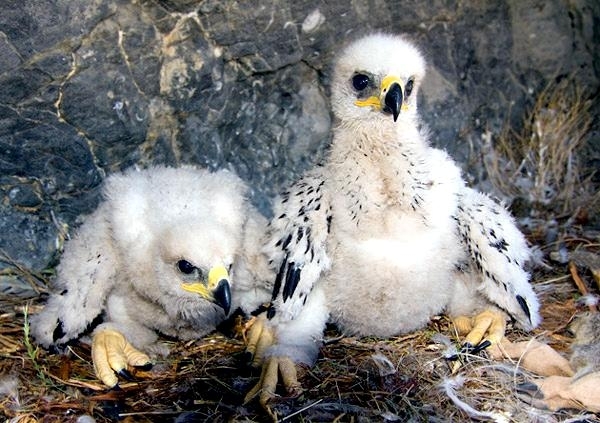 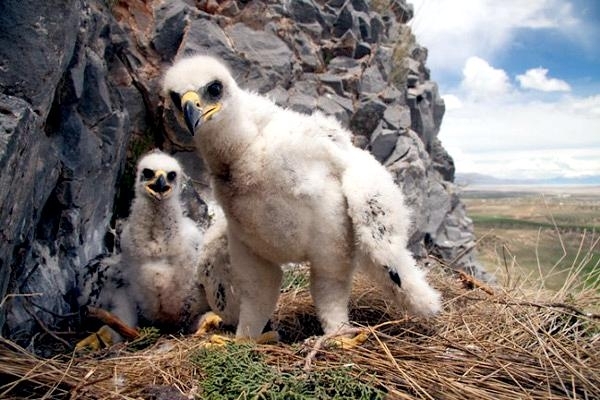 Females are larger than males and have a slightly longer wingspan. 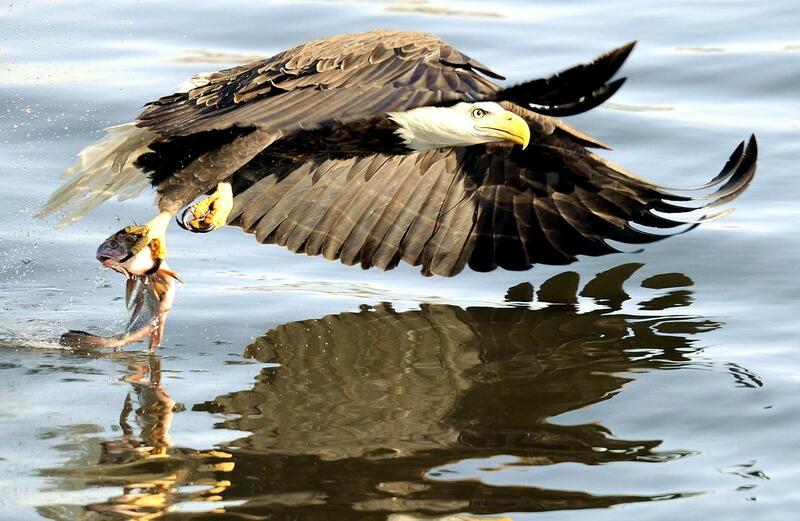 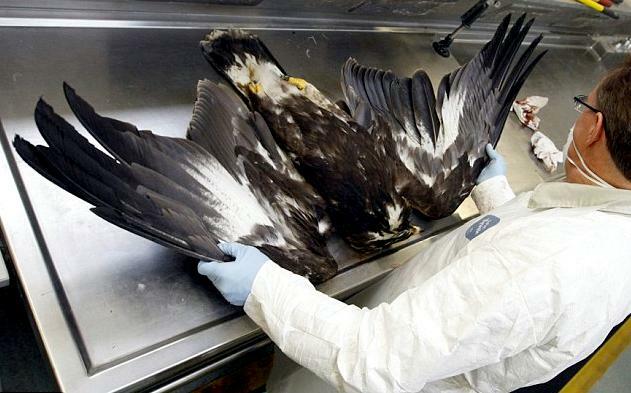 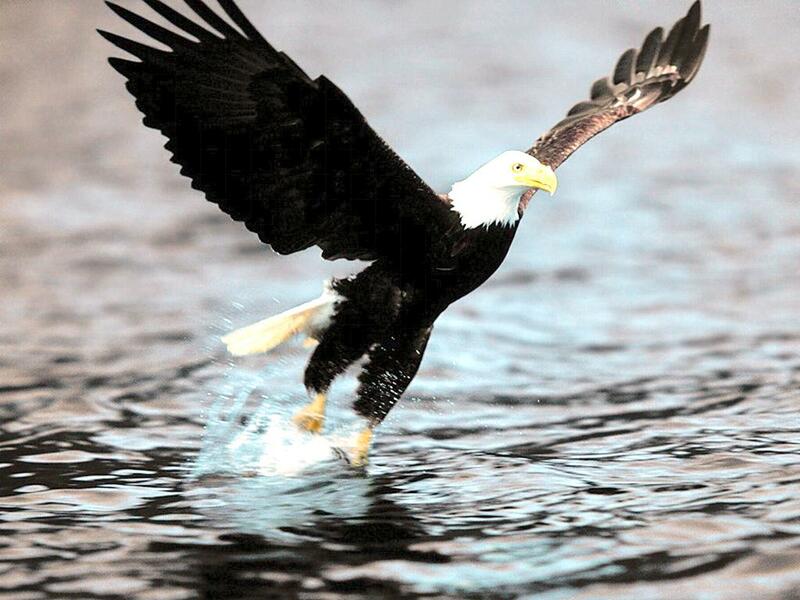 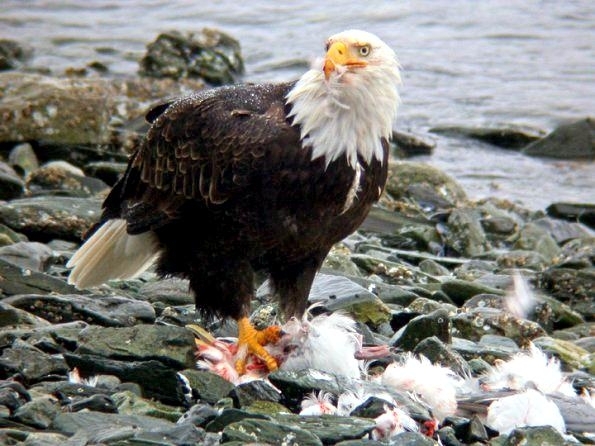 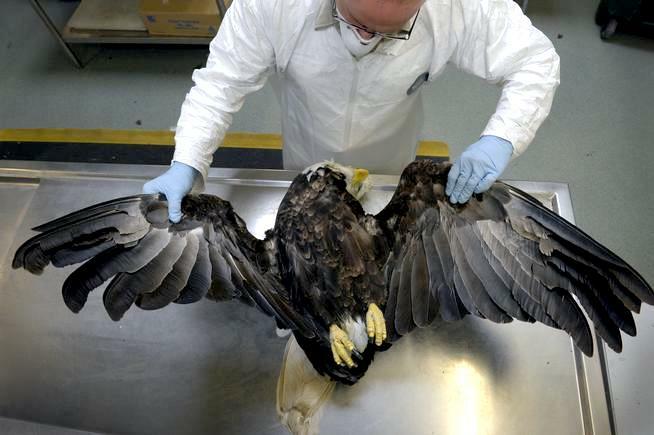 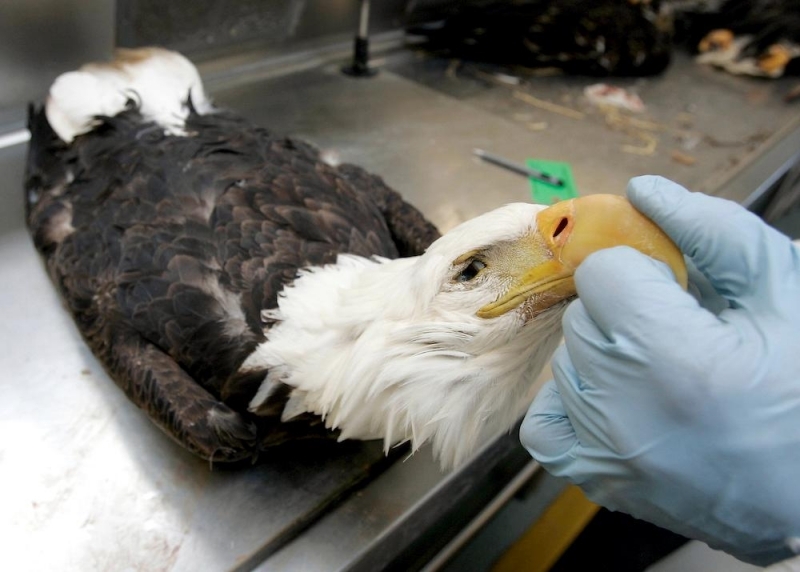 Bald Eagles primarily eat fish, carrion, smaller birds and rodents. 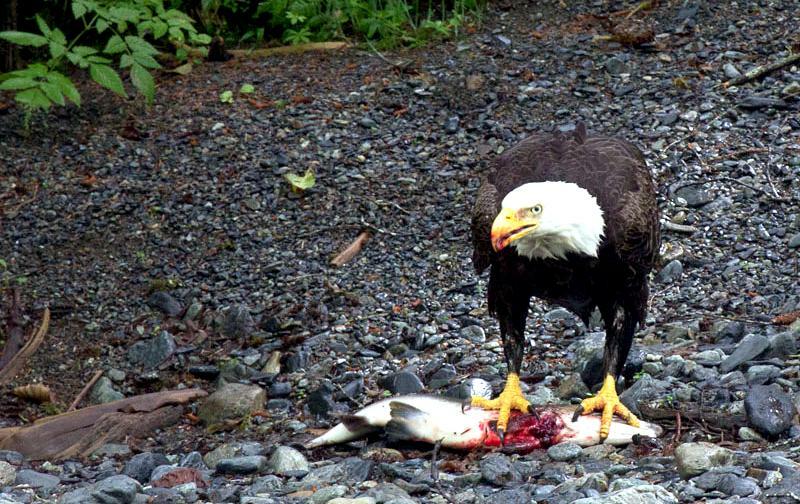 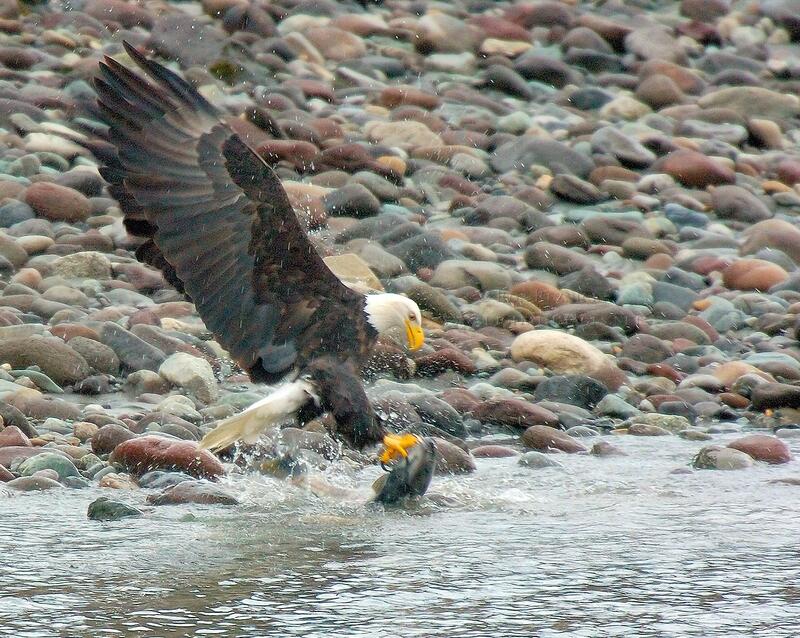 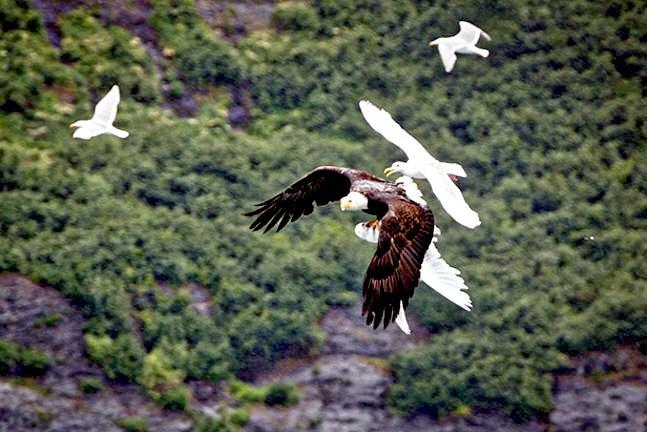 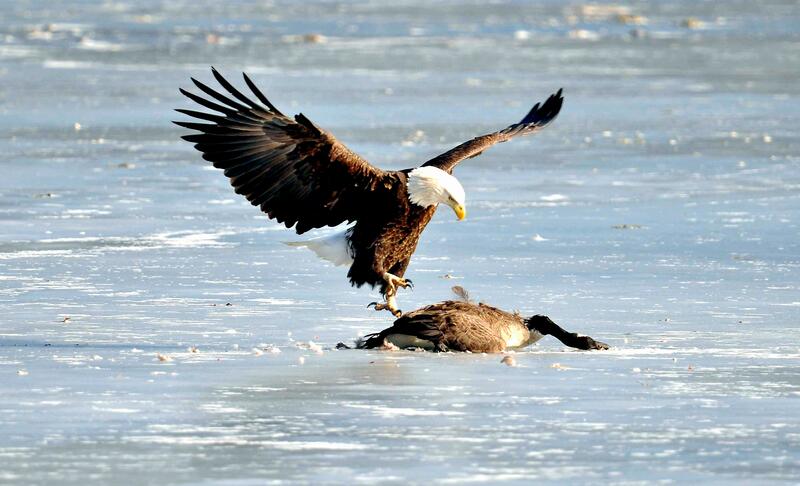 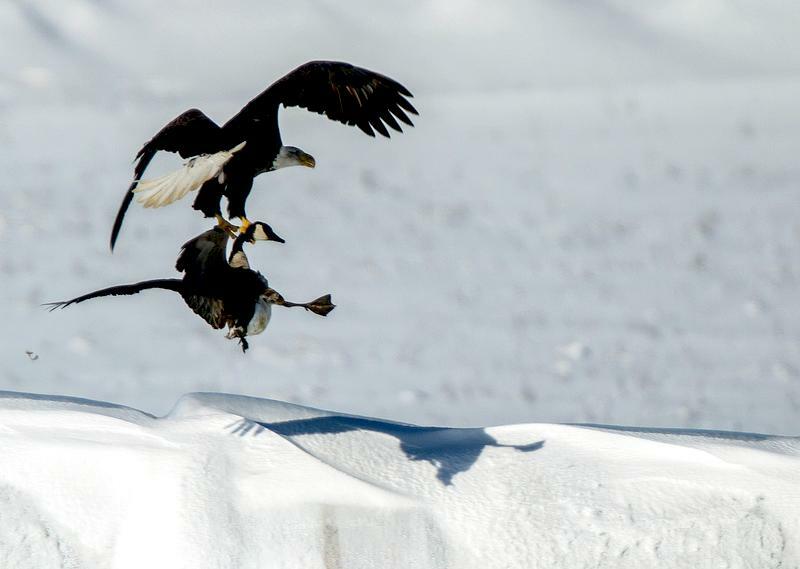 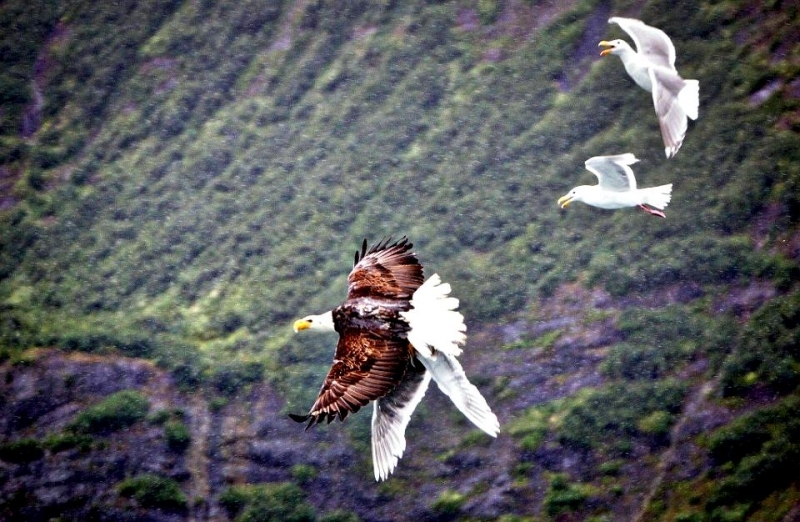 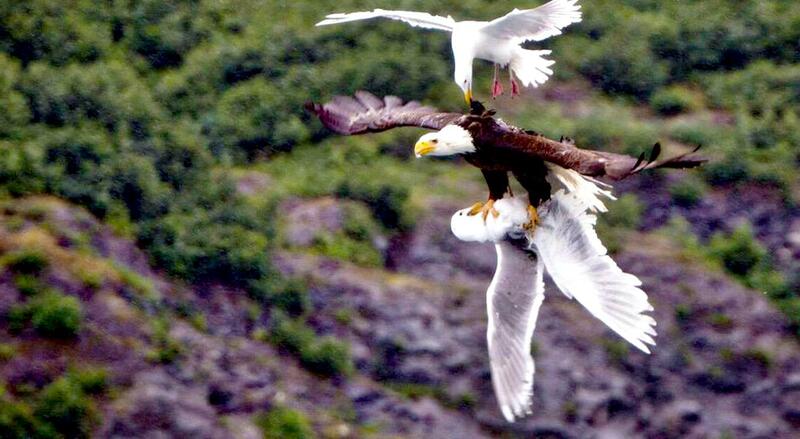 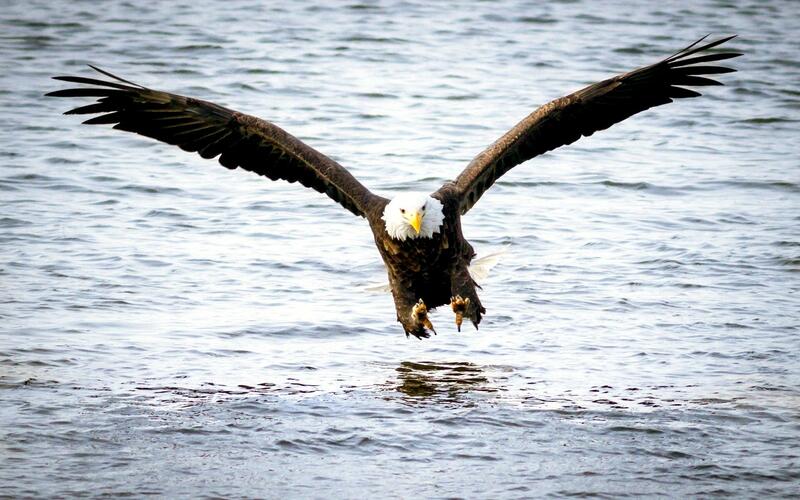 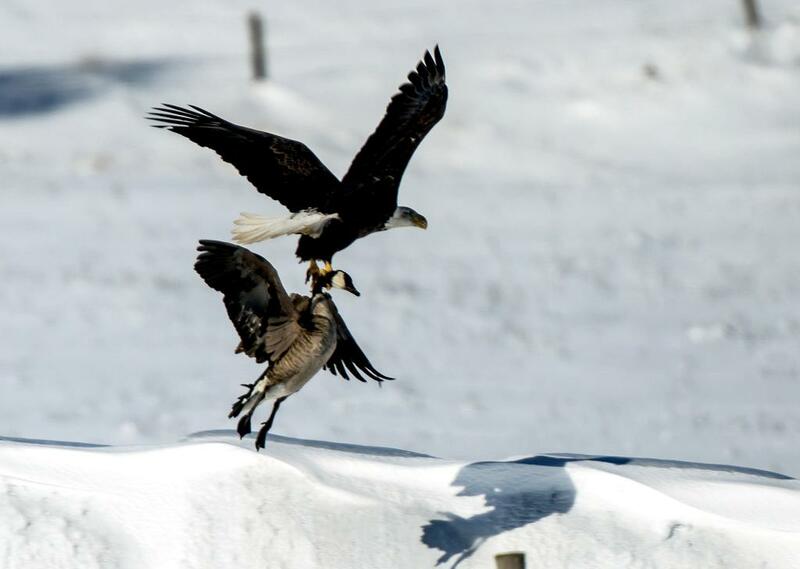 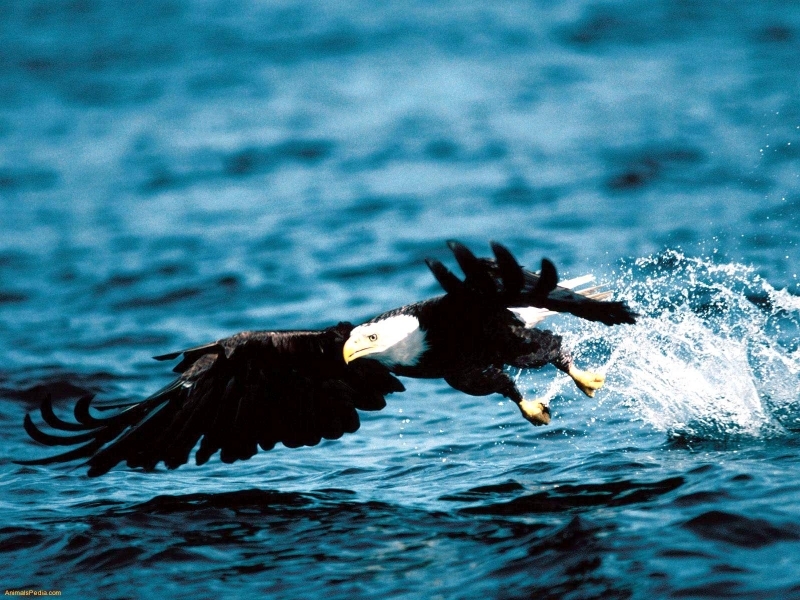 Eagles are also known to prey on large birds and large fish. 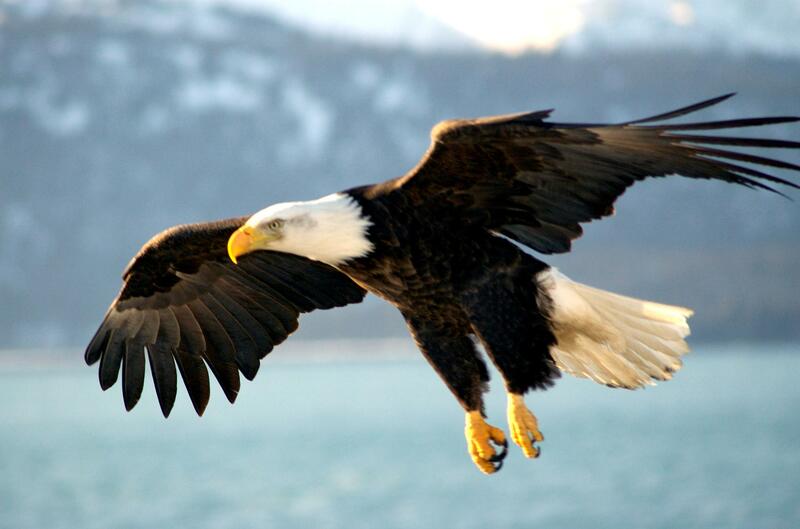 Bald Eagle numbers in the U.S. were estimated to be between 300,000-500,000 in the 1700’s. 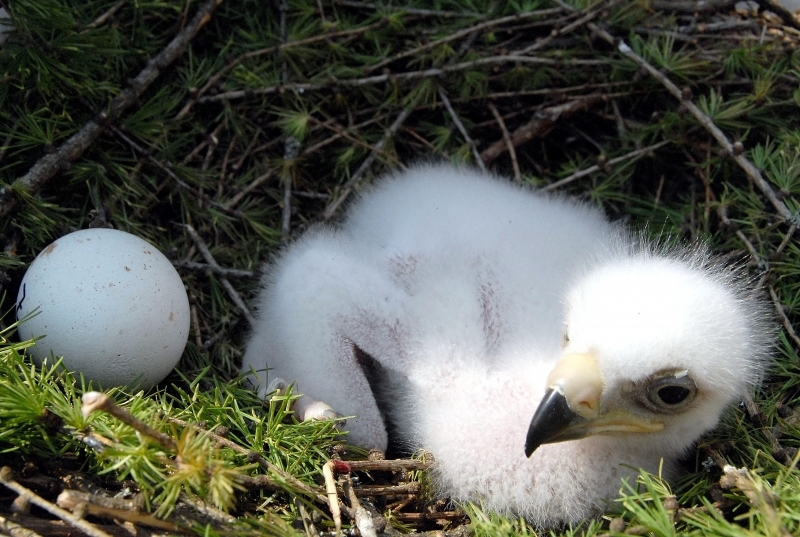 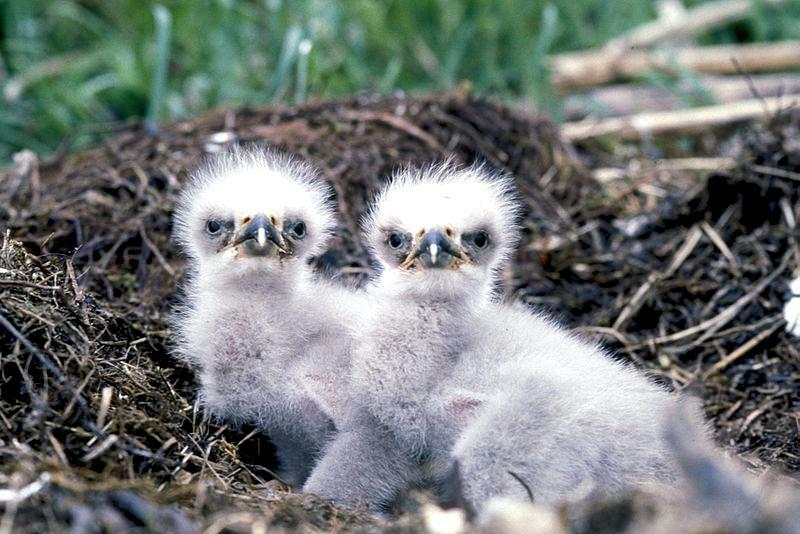 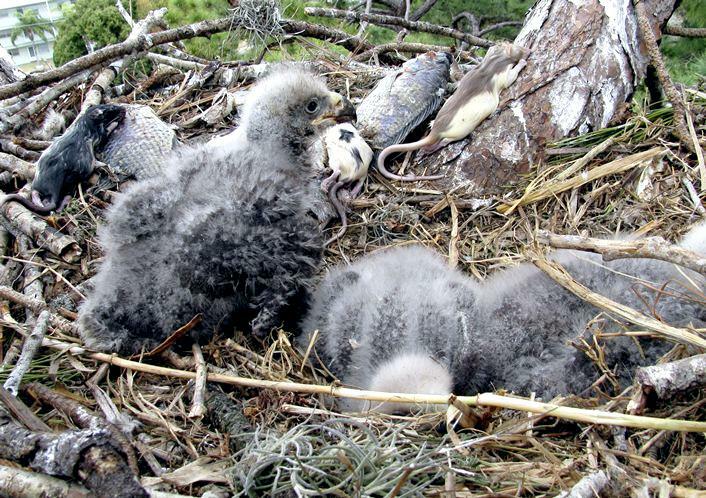 Numbers were once as low as 500 nesting pairs in the lower 48 states. 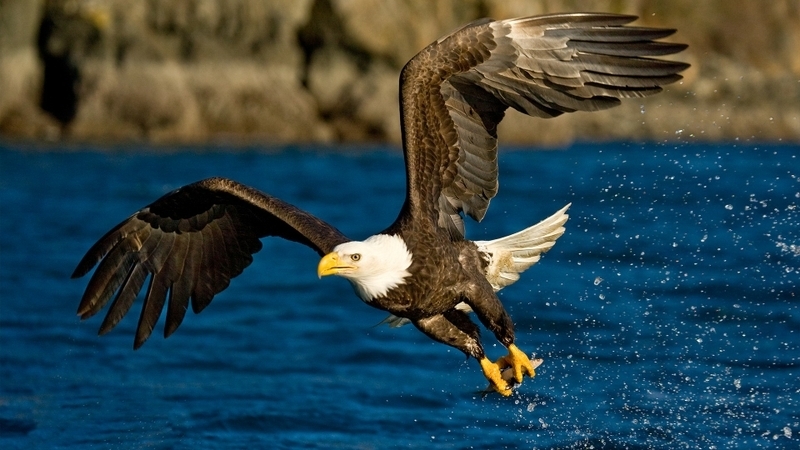 Bald Eagles occur from Baja California and Florida north to Newfoundland and Alaska. 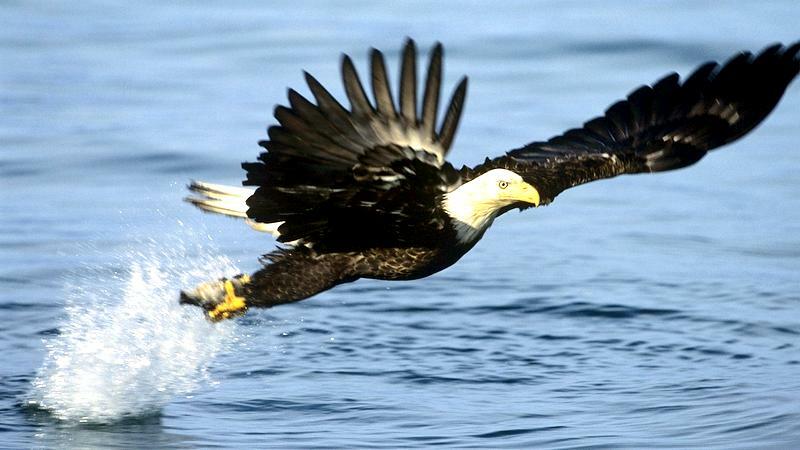 Within this area, they are nearly always found near water, along rivers, lakes or the sea coast & coastal marshes, reservoirs and large lakes. 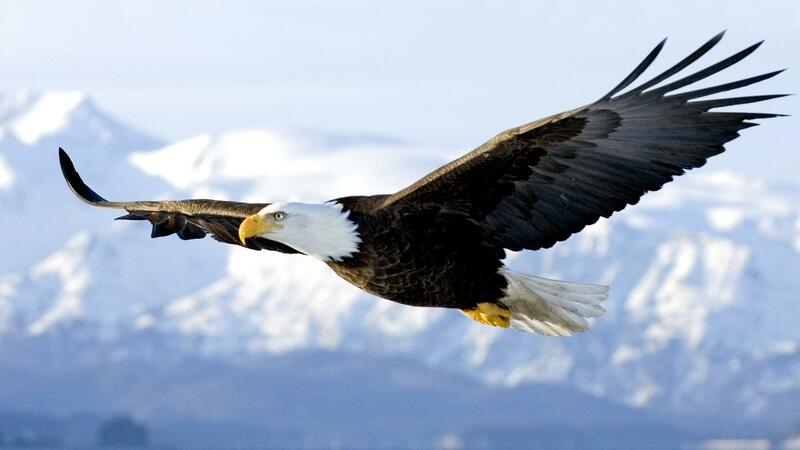 They also pass over mountains and plains during migration. 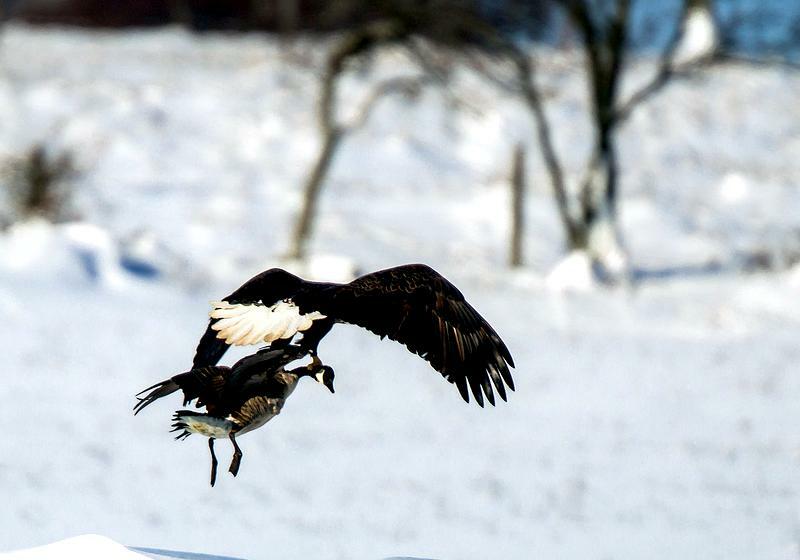 The northern and interior populations may migrate to open water in the winter months. 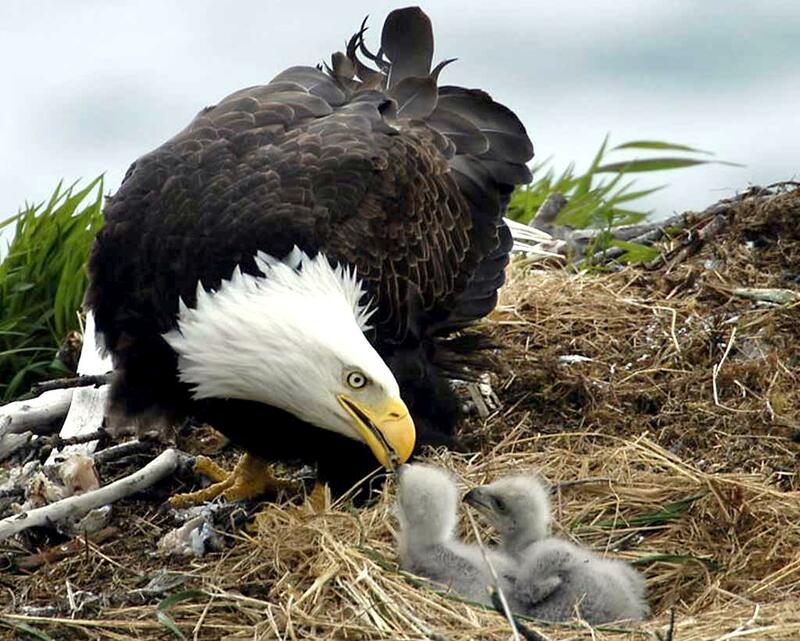 Bald Eagles breed in much of Alaska where they are most common, Canada, the Pacific Northwest, along the East Coast, the Mississippi River and the Gulf Coast, around the Great Lakes and in other areas with sufficient water and wildlife. 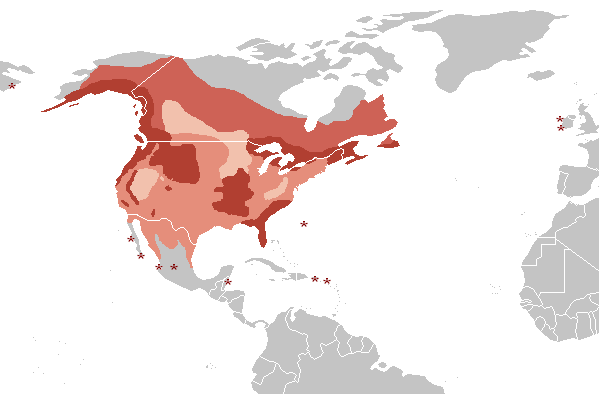 The birds winter along the coasts and across much of the U.S. With others reaching northwestern Mexico. 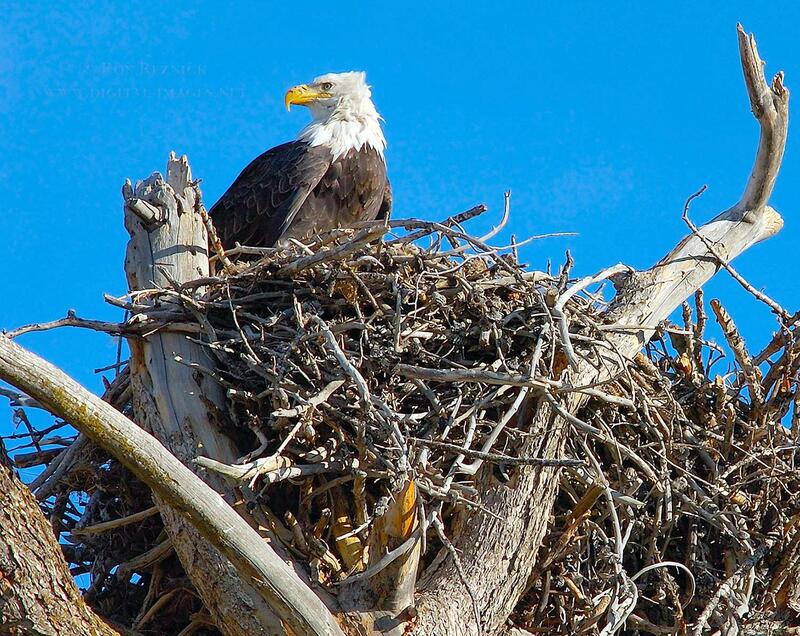 Bald Eagle numbers have rebounded since and now the lower 48 states boast over 5,000 nesting pairs. 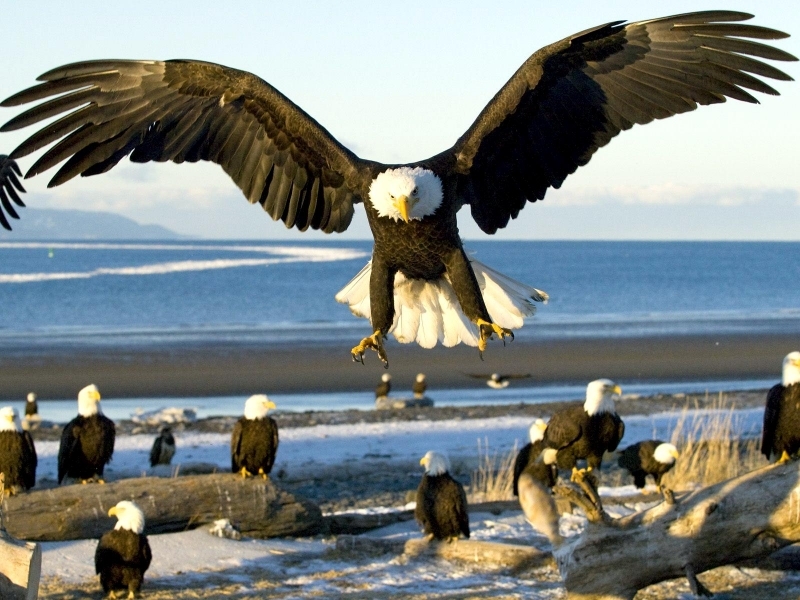 There are a total of about 70,000 Bald Eagles in the whole of North America. 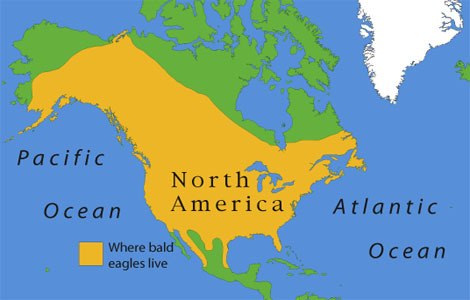 Bald Eagles live near bodies of water in Canada and Alaska and in scattered locations all throughout the lower 48 states and Mexico. 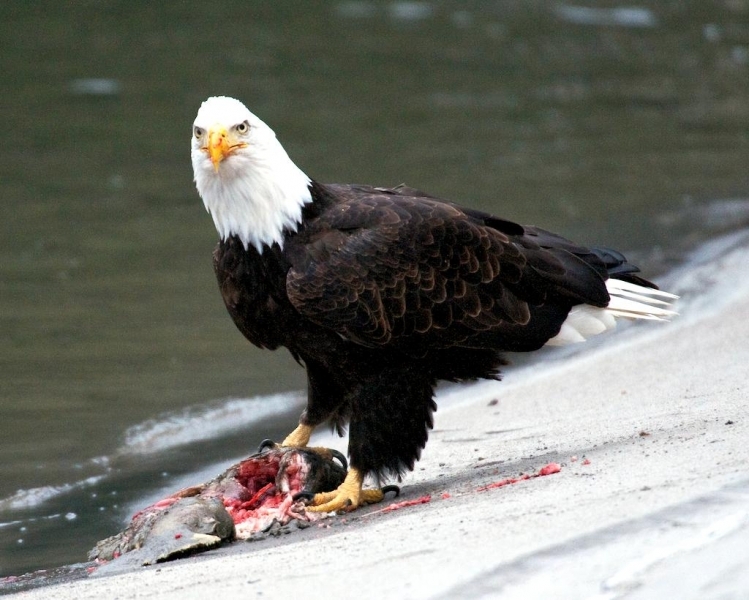 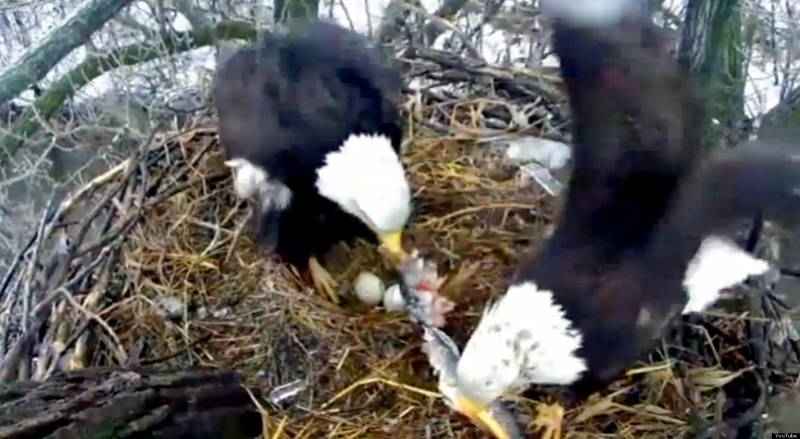 The Bald Eagle is not picky about how it gets its food. 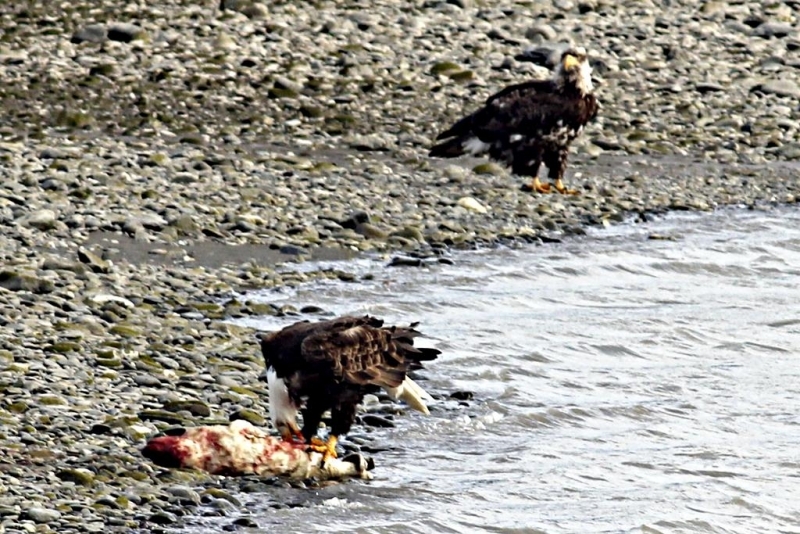 It will eat carrion, steal fish from other birds or hunt for its own. 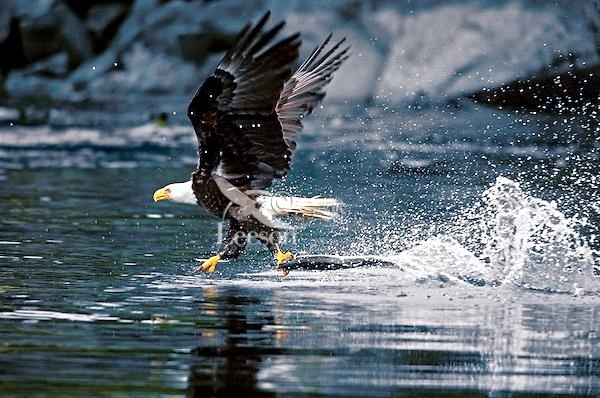 Their most important non-carrion food is fish, which they catch by swooping down and grabbing fish that are near the surface of the lake or stream. 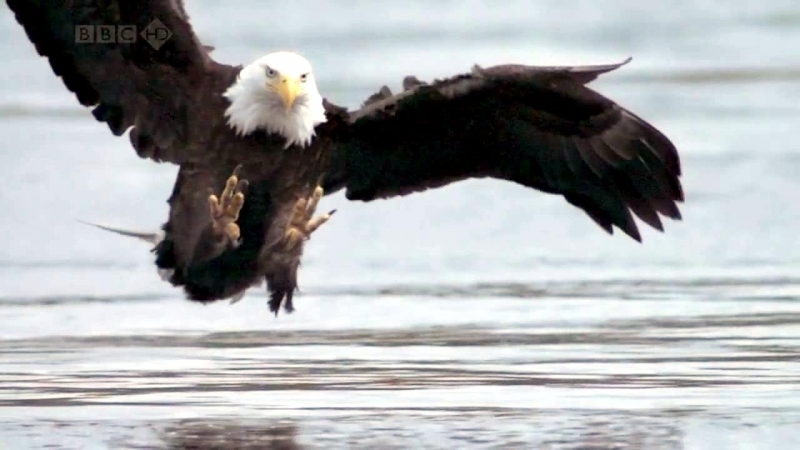 Bald Eagles make a high-pitched squeaking sound. 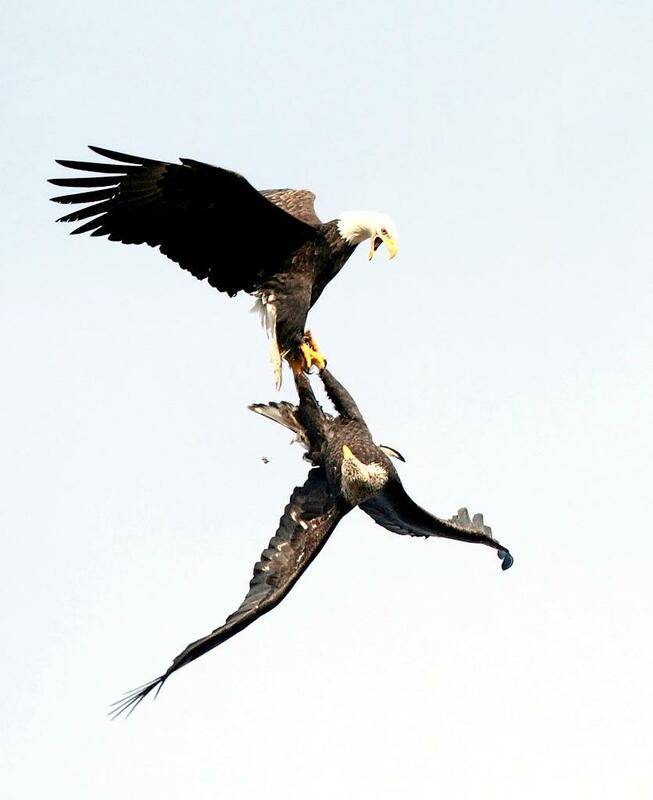 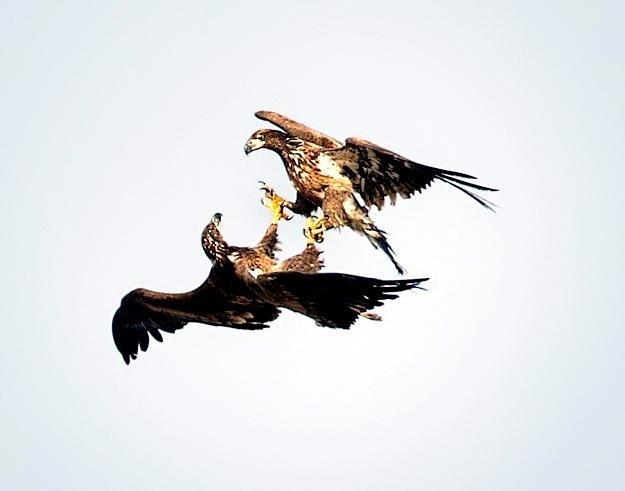 Other interesting behaviors include “talon clasping” or “cartwheel display”, where two eagles clasp each others talons in mid air & spin down, letting go only when they’ve almost reached the ground. 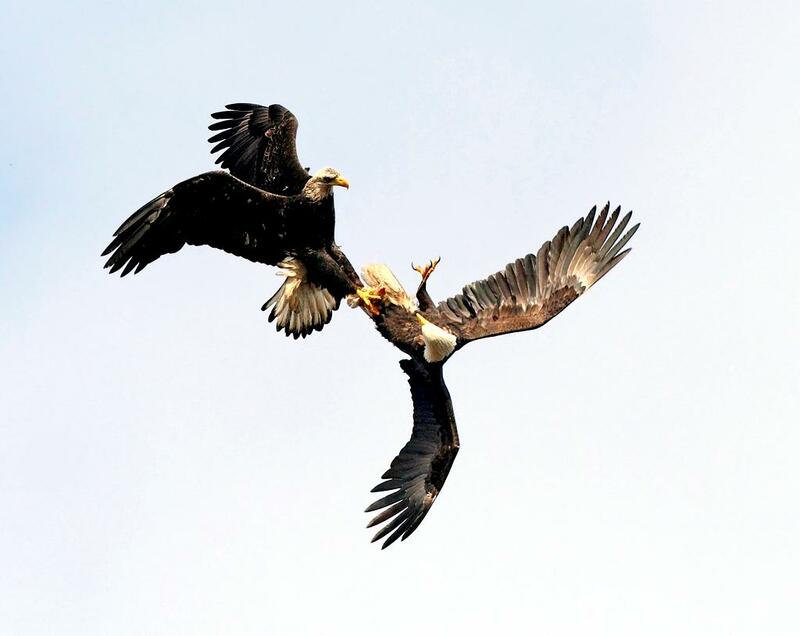 This is may be a courtship ritual as well as a territorial battle. 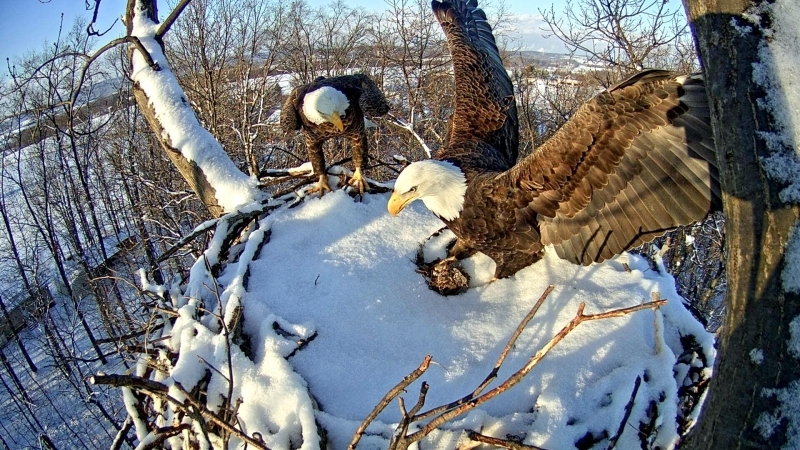 During breeding season, the male & female work together to build a nest of sticks, usually located at the top of a tree. 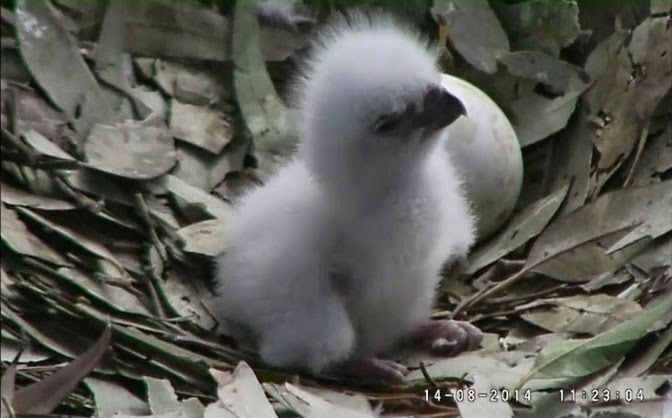 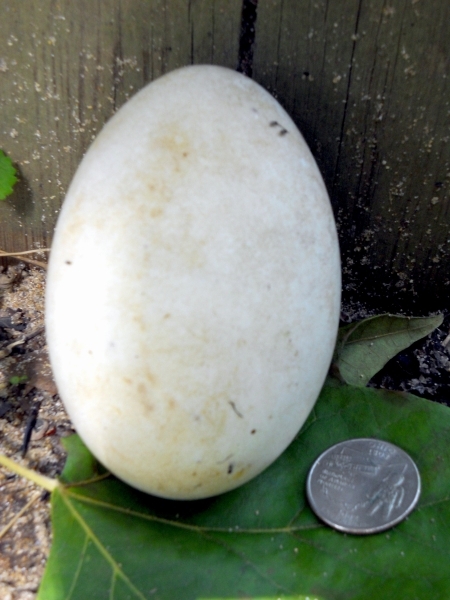 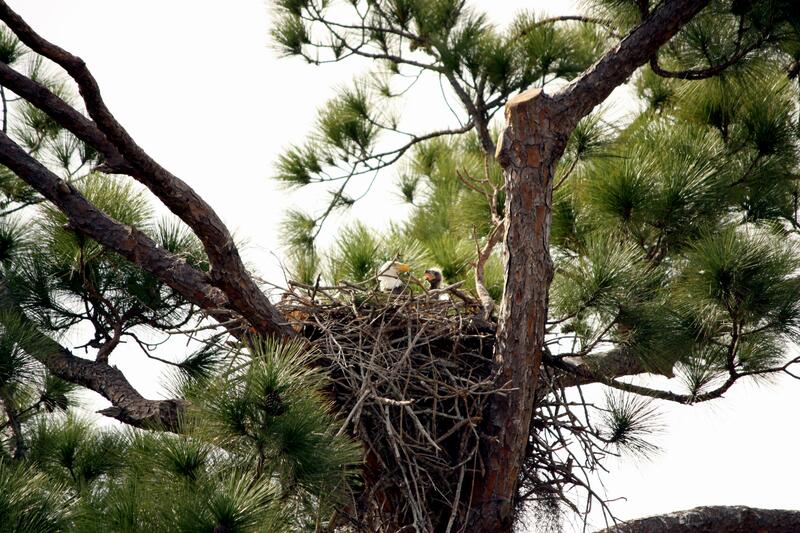 The nests can weigh up to a ton and measure up to 8 feet across. 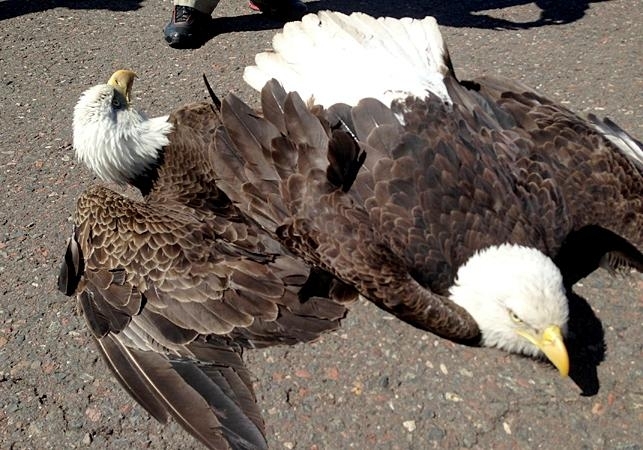 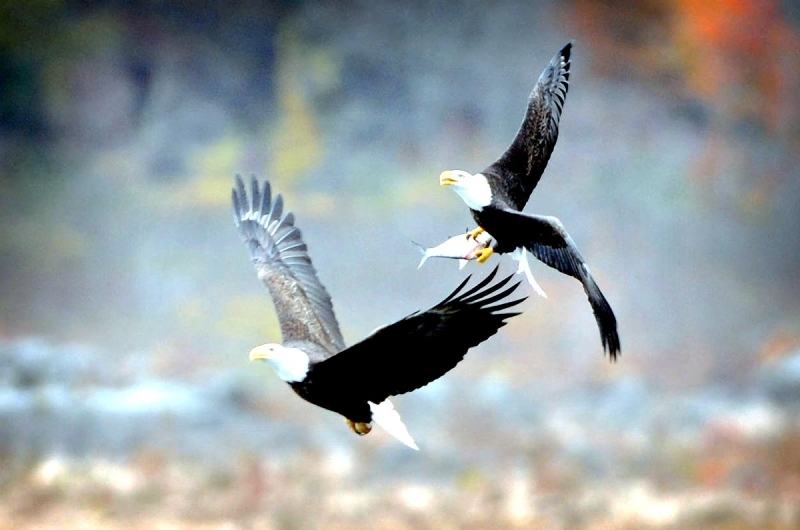 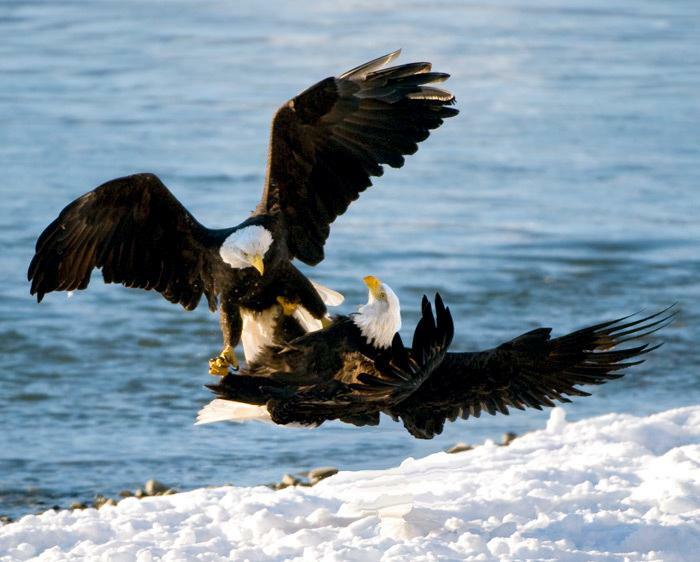 Once paired, Bald Eagles remain with each other until one mate dies, then the surviving bird will find another mate. 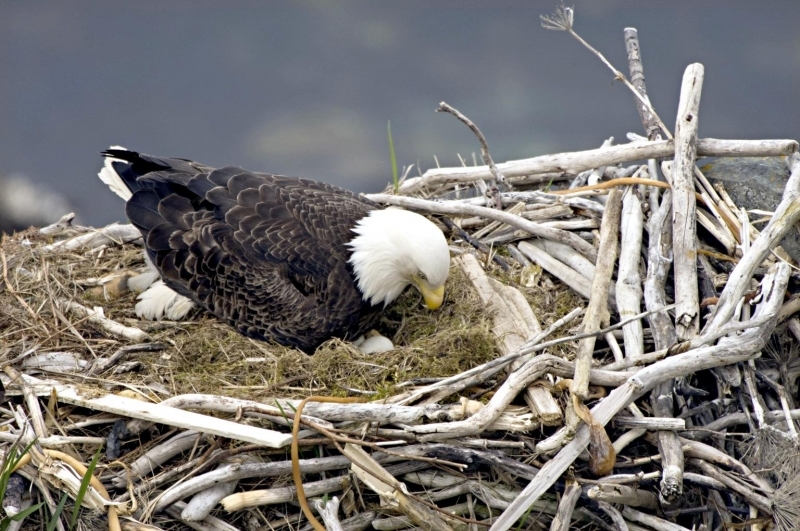 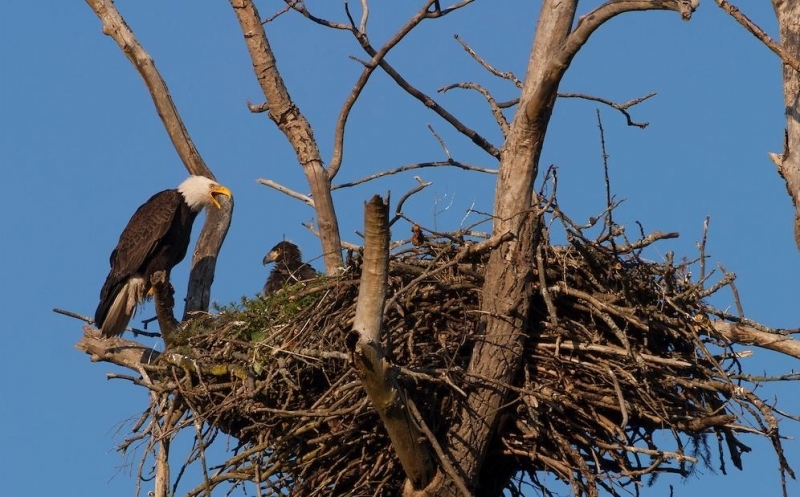 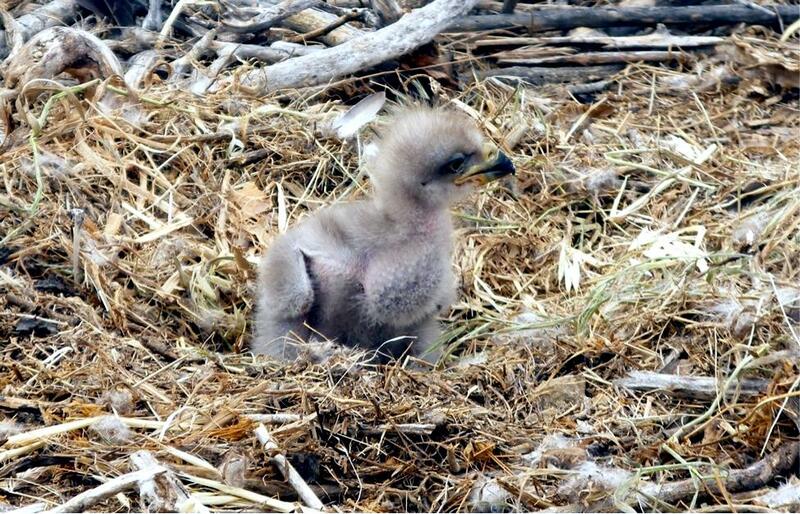 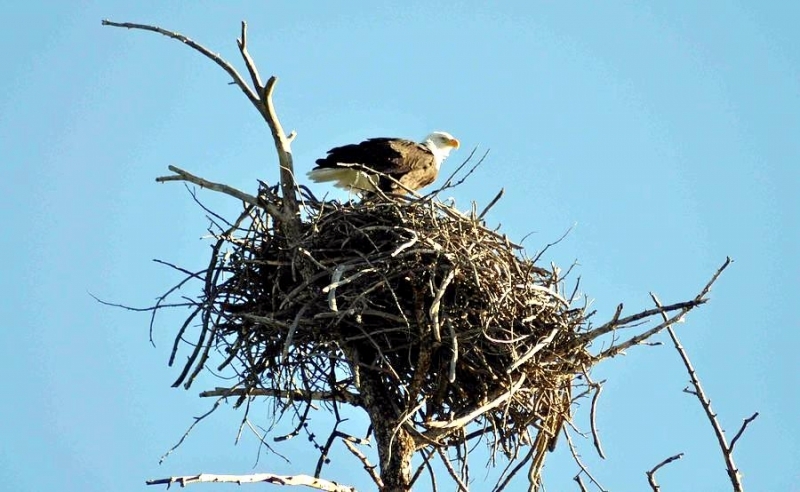 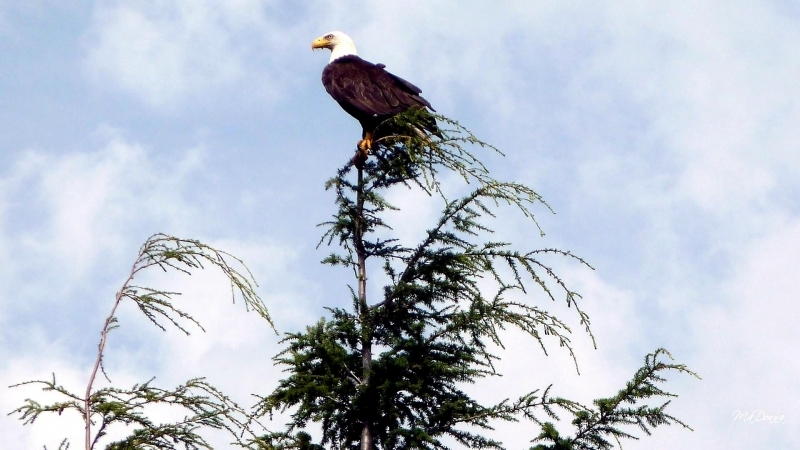 Bald Eagles construct their nests near water in tall trees or on cliffs using large sticks. 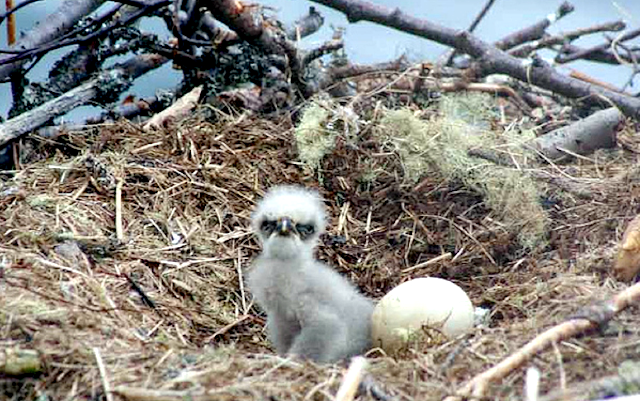 The nest is lined with twigs, grasses and other soft materials. 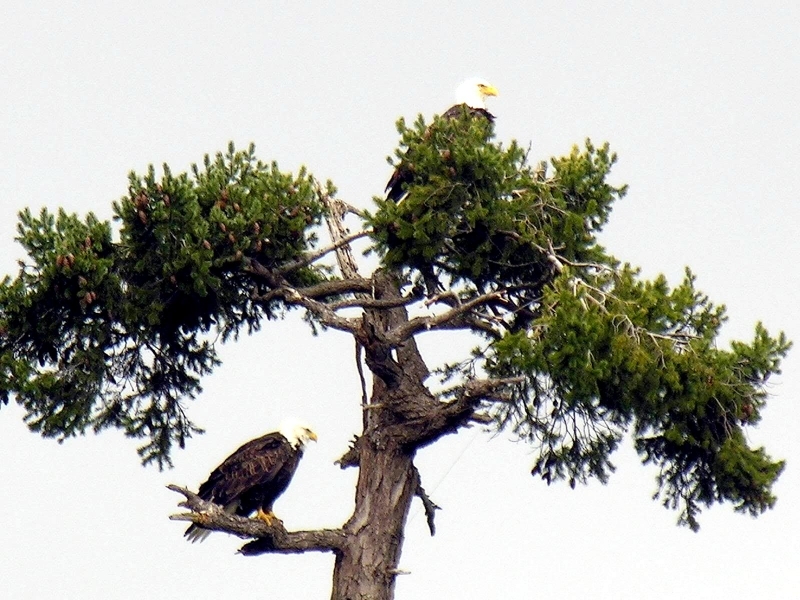 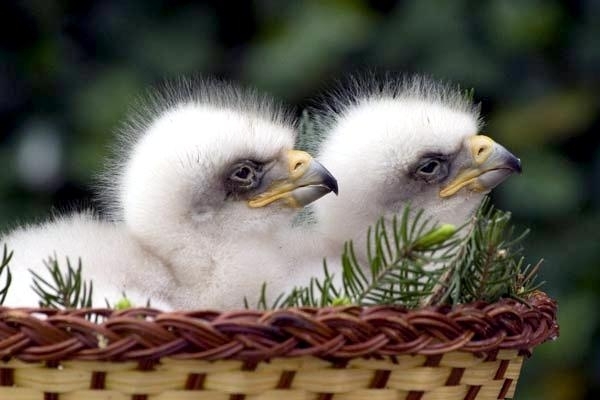 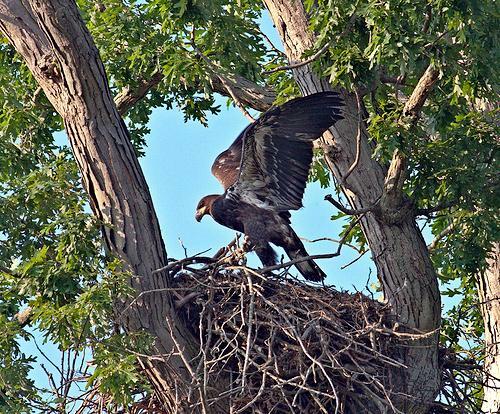 Each year, a pair works together to build a large stick nest high in a tree or on a cliff. 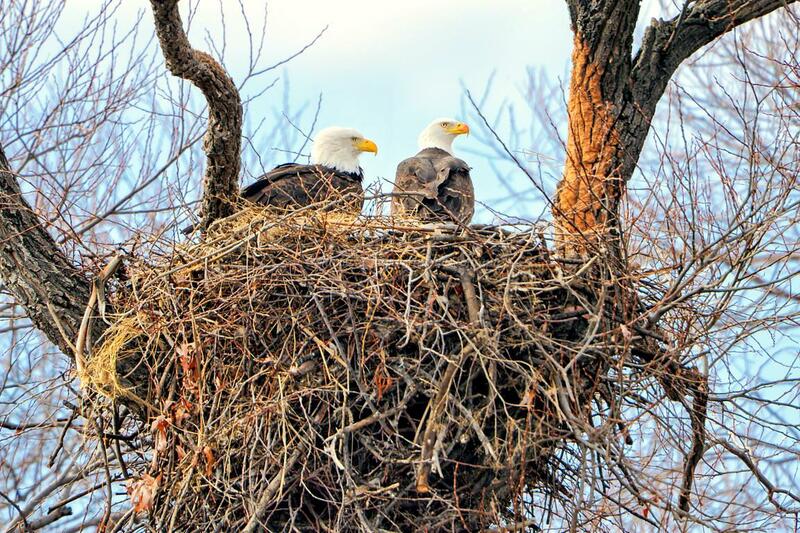 Sometimes a pair reuses the same nest for years. 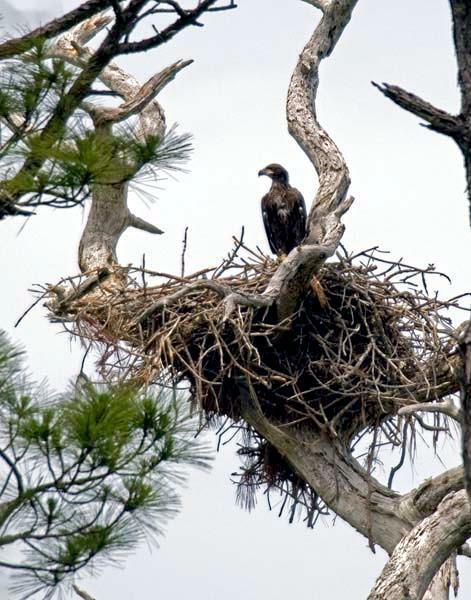 Since these nests are used year after year, they may become very large. 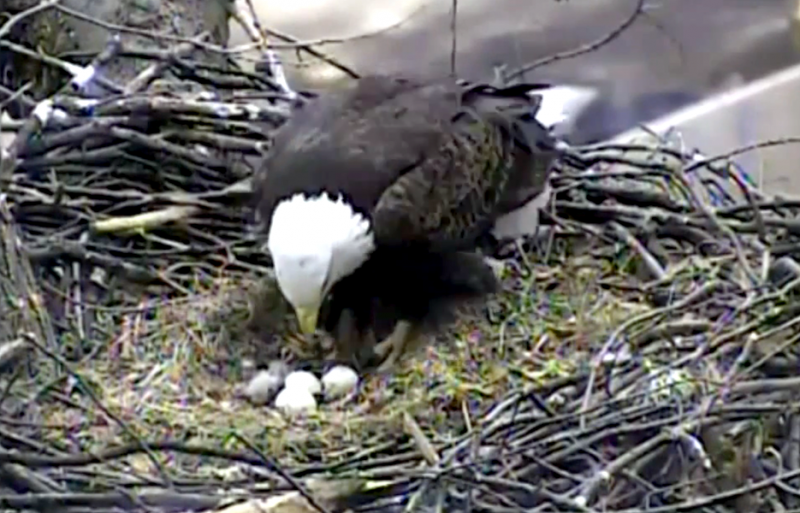 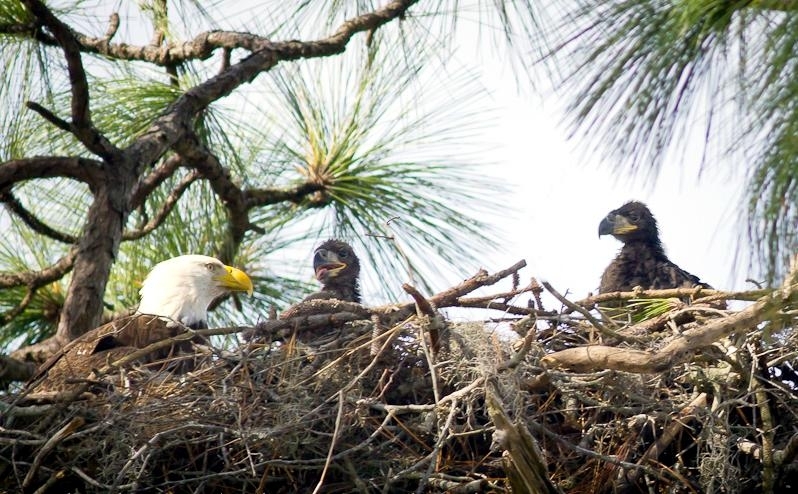 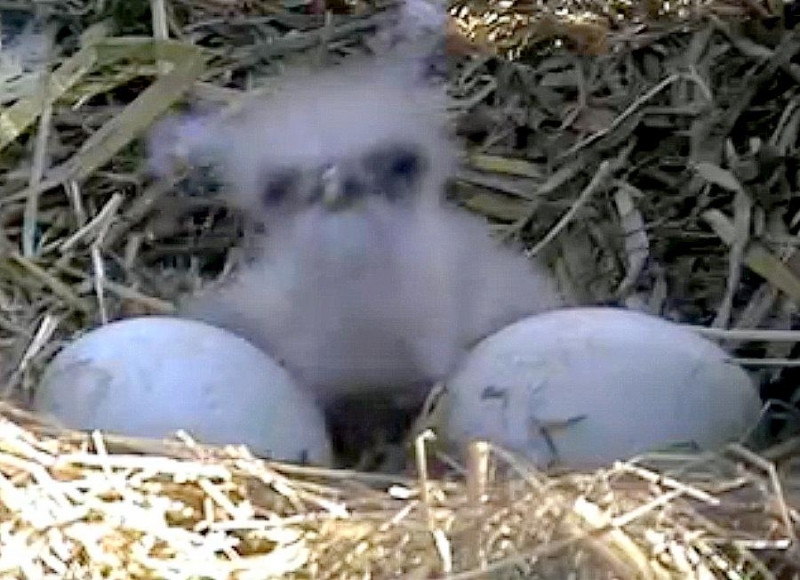 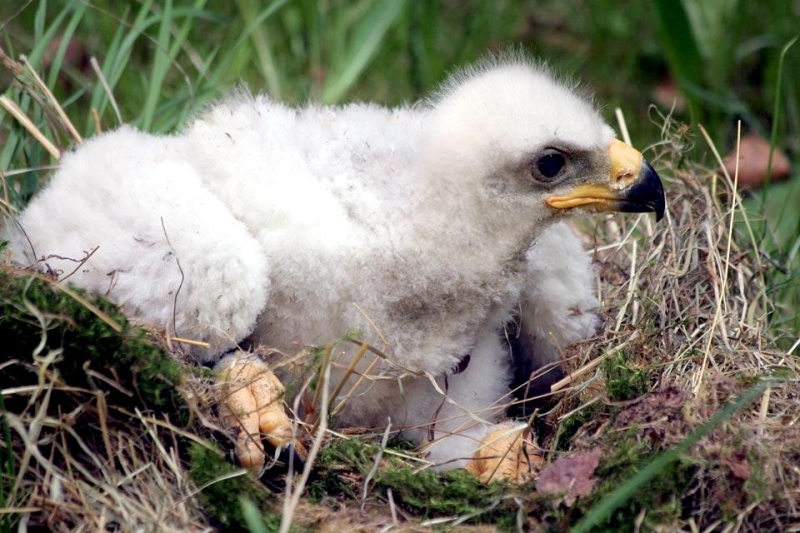 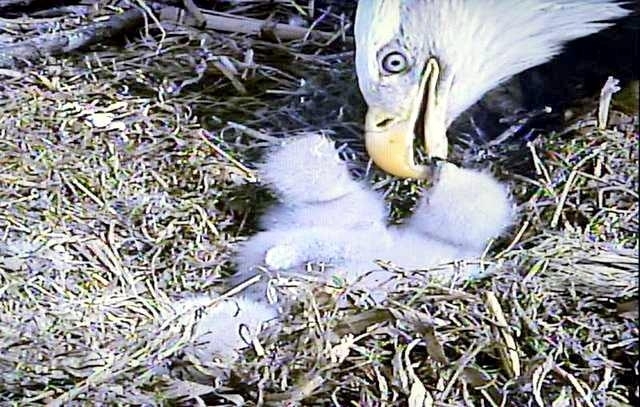 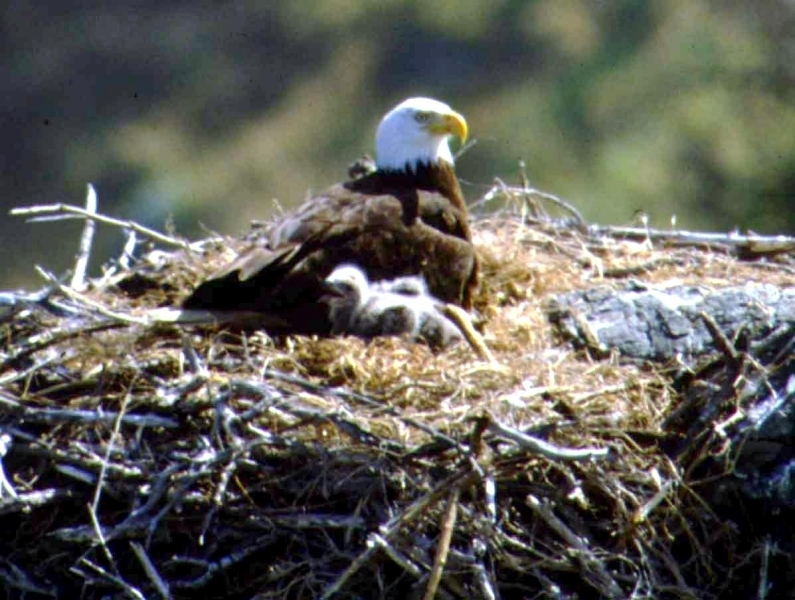 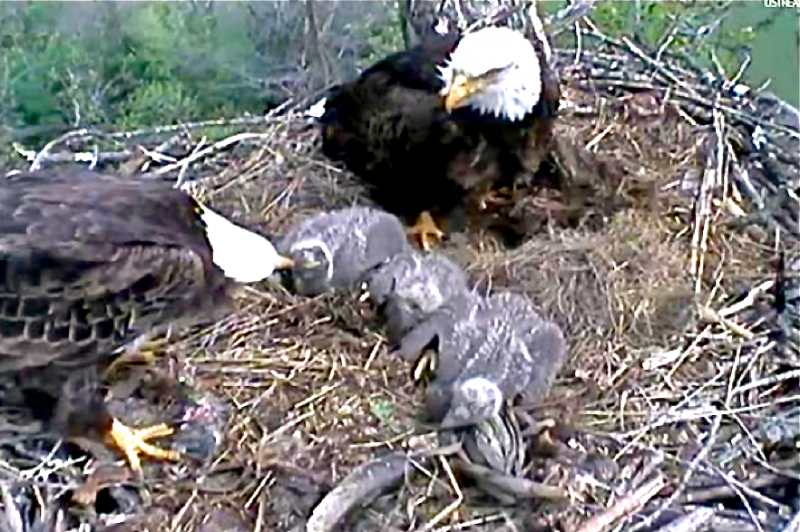 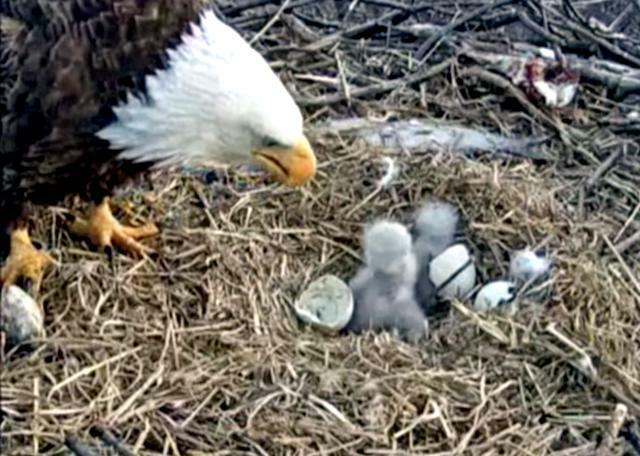 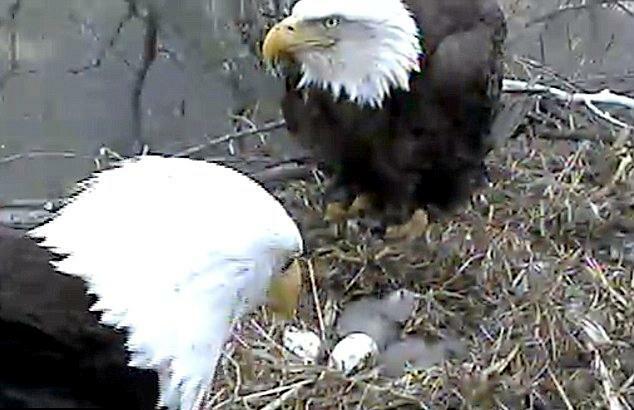 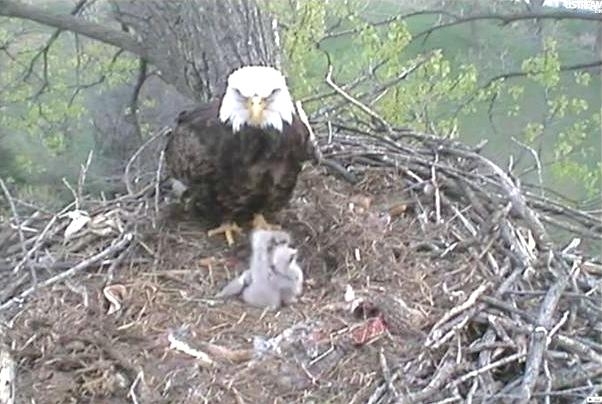 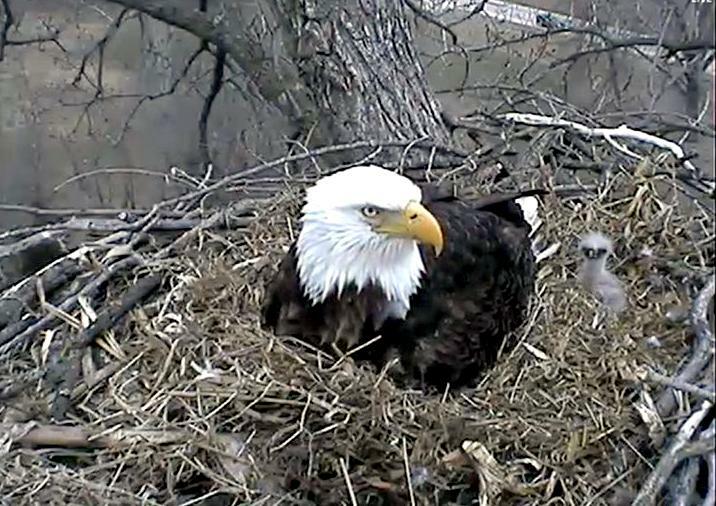 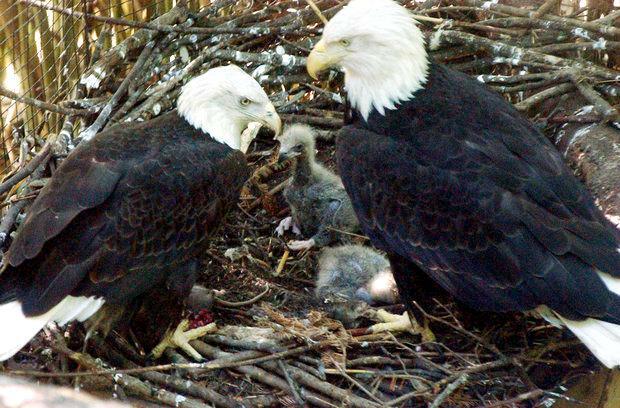 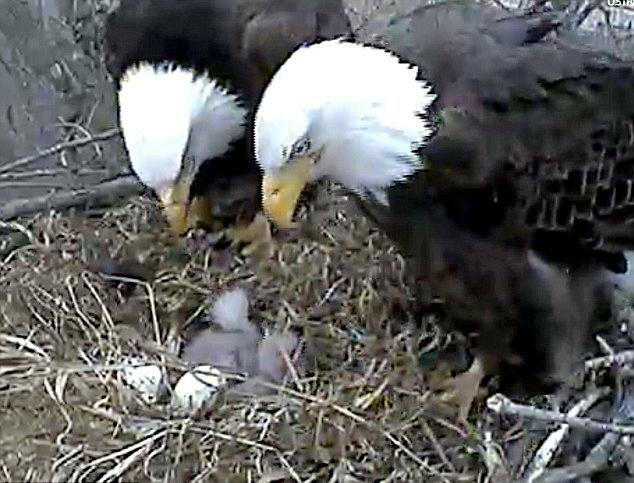 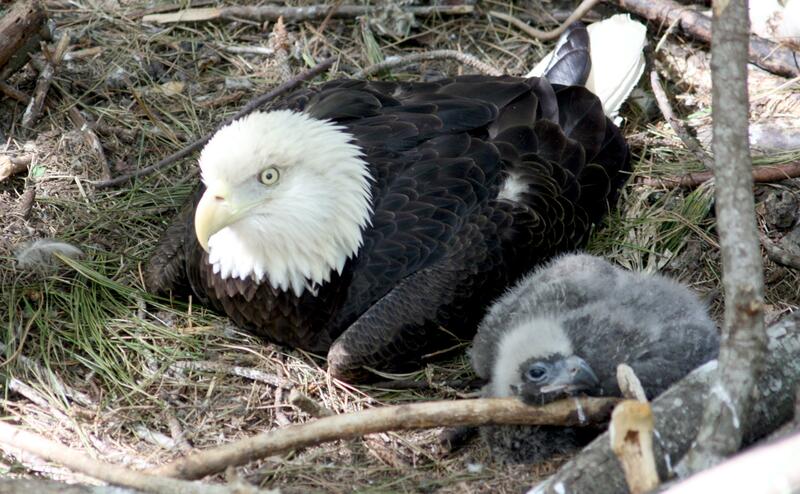 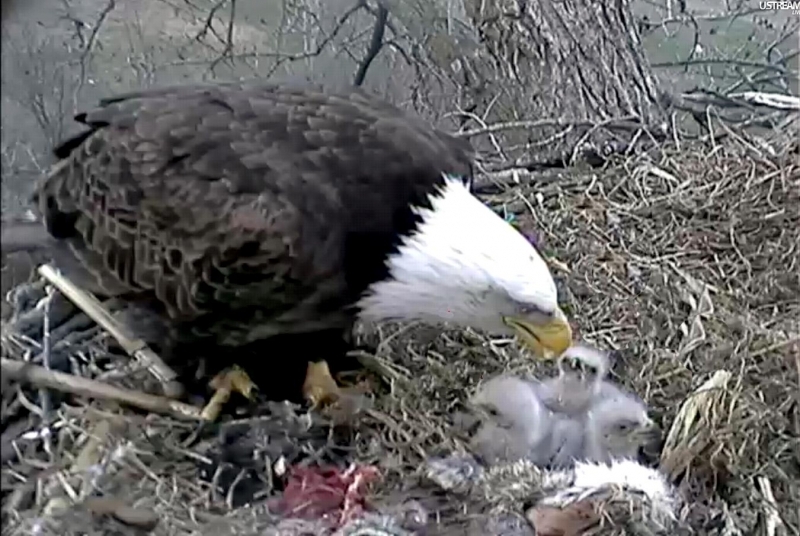 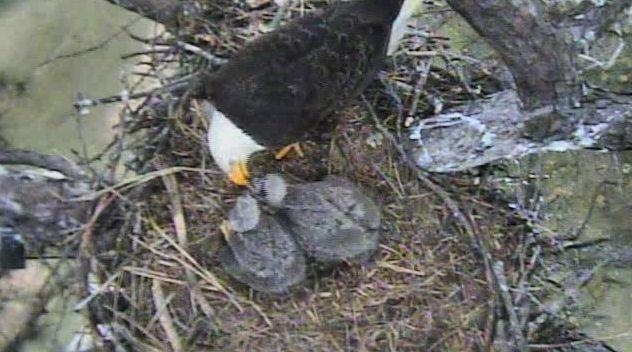 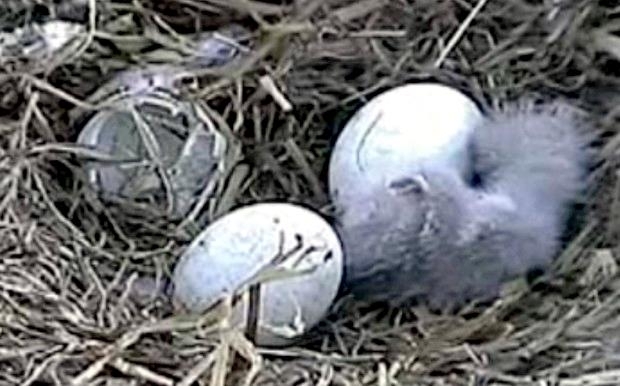 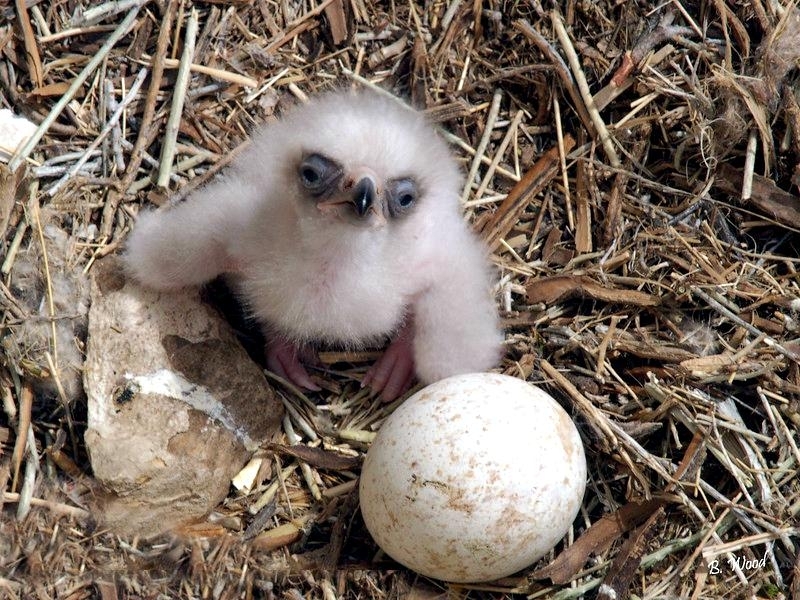 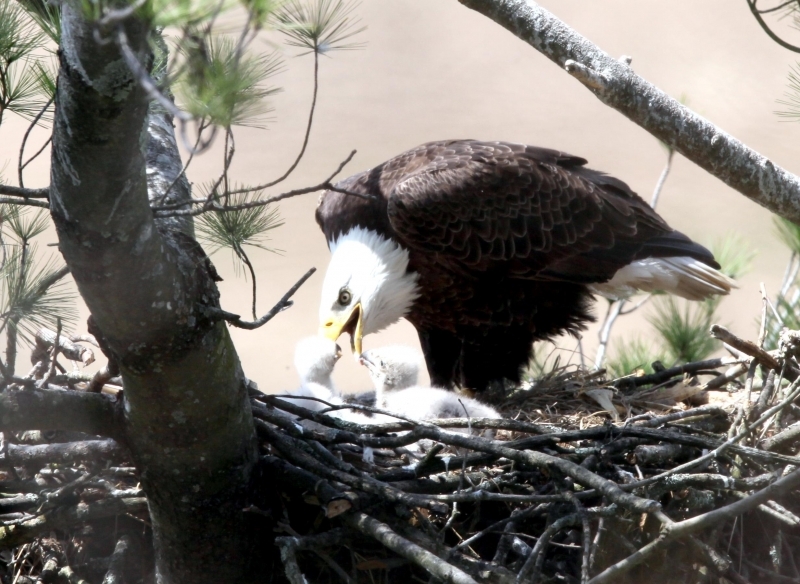 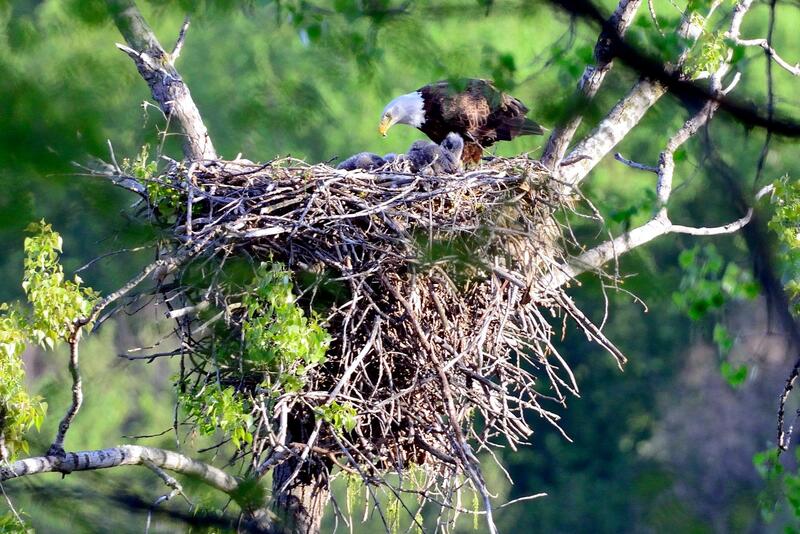 Bald Eagles lay 2, occasionally 3 eggs that are incubated by both parents in turns for 34 to 36 days. 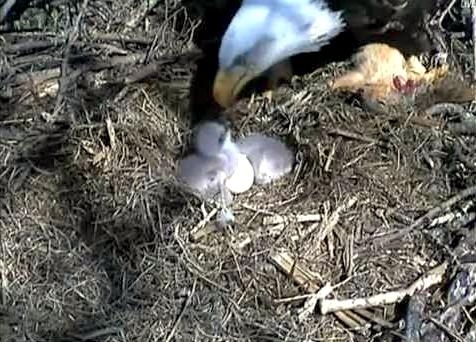 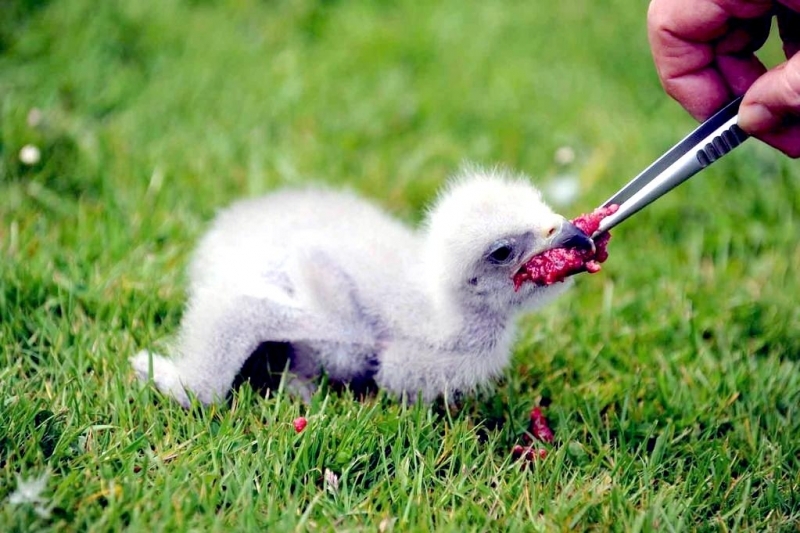 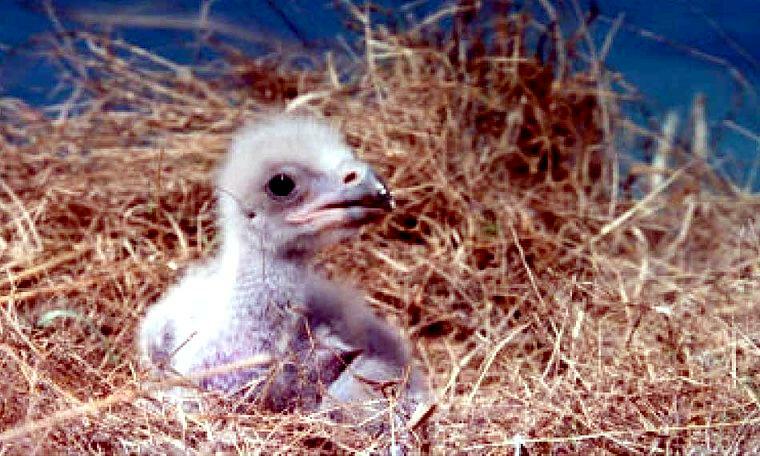 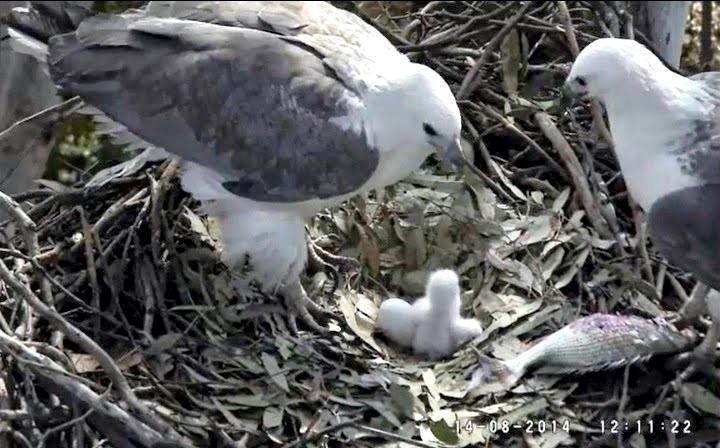 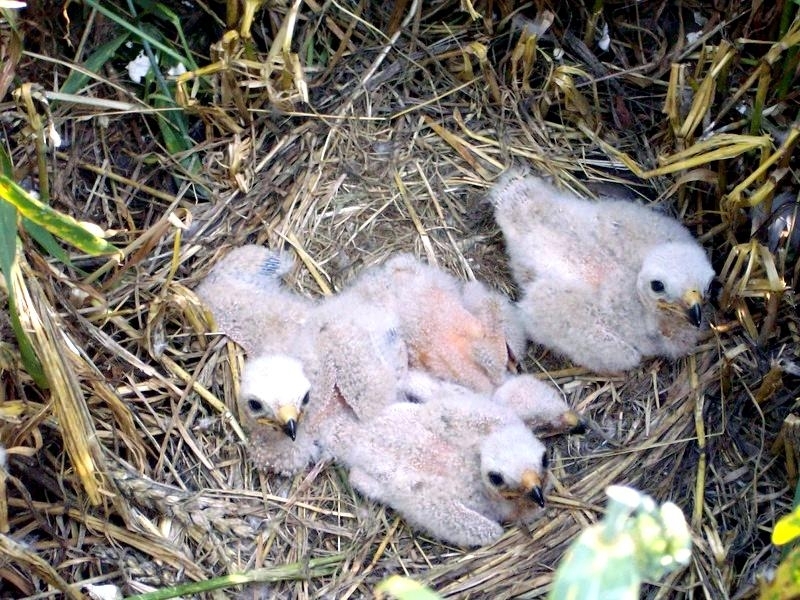 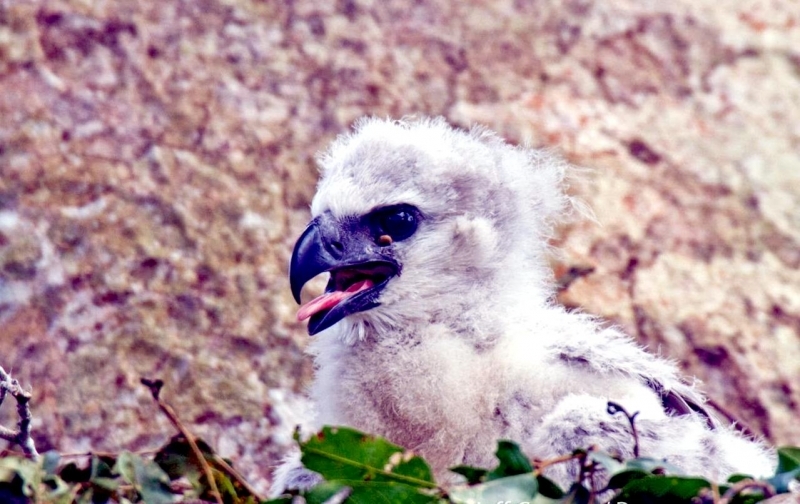 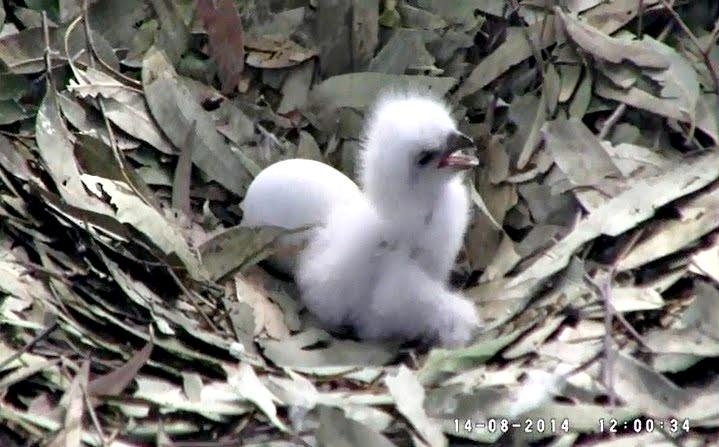 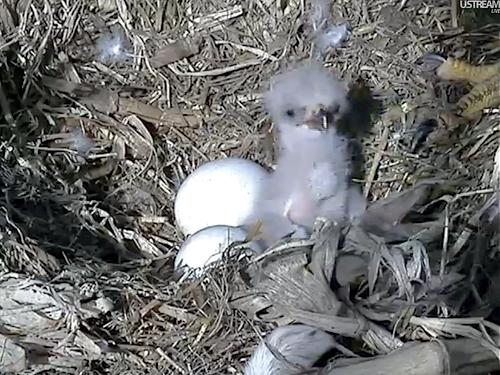 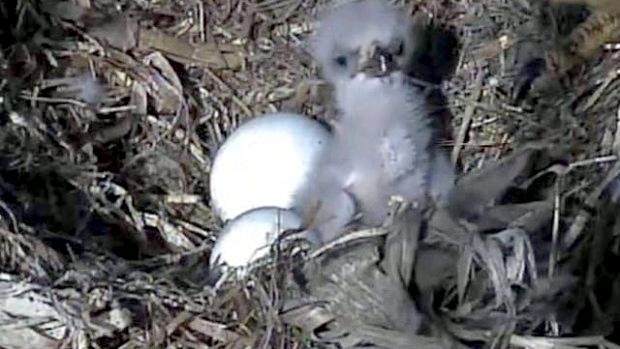 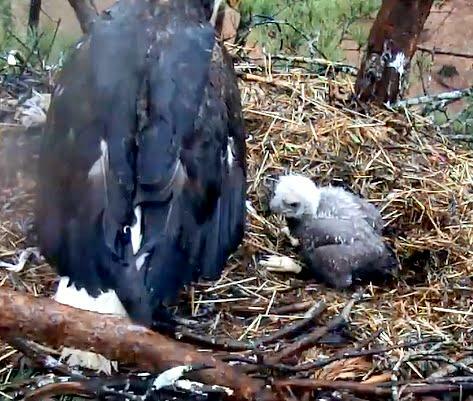 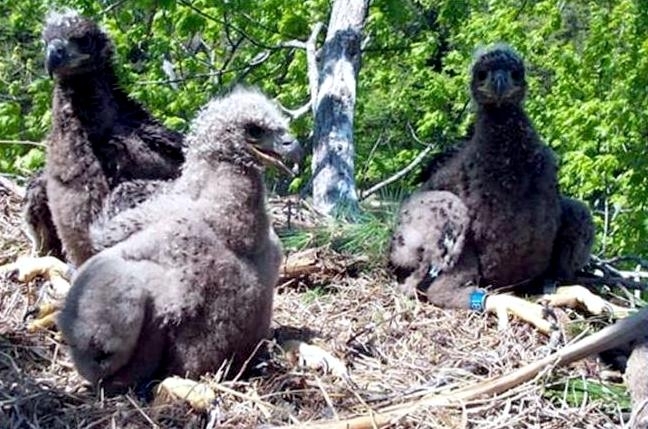 Often only one chick survives, but if food is plentiful they may rear 2 or occasionally 3. 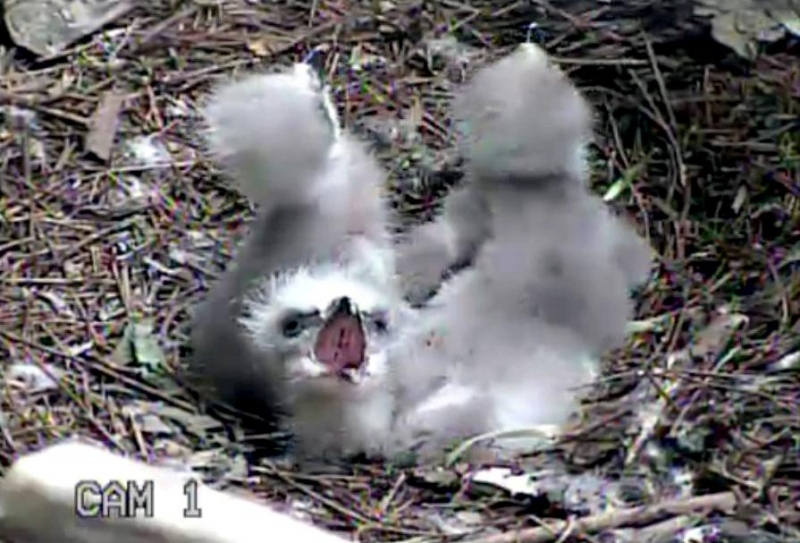 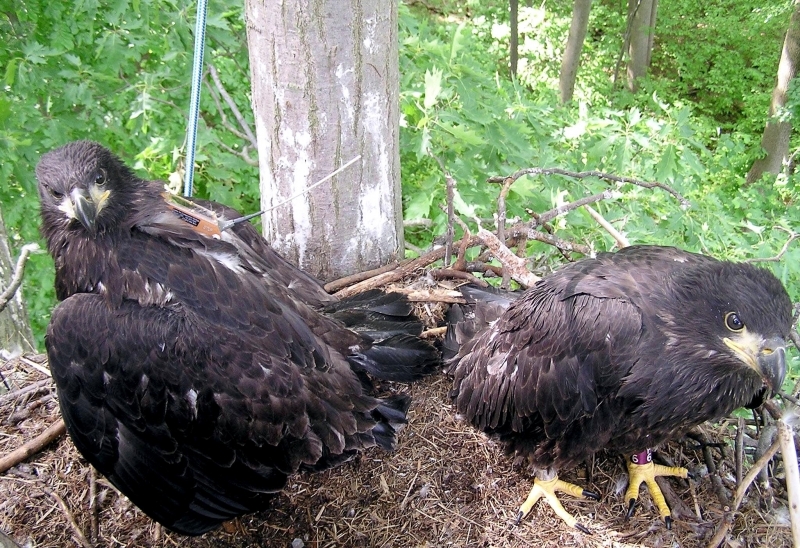 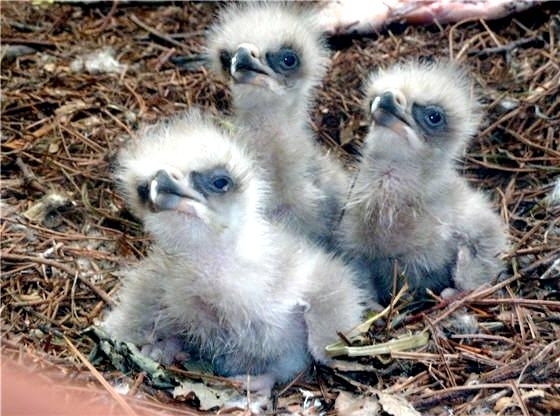 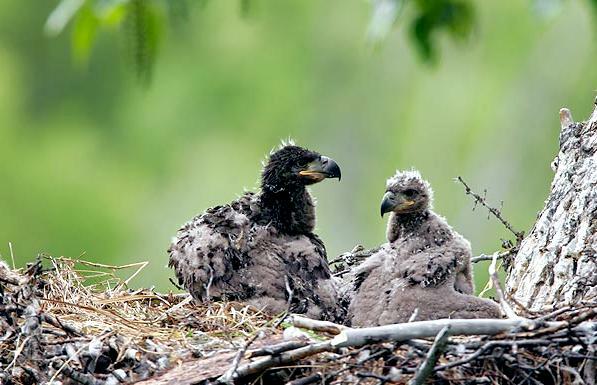 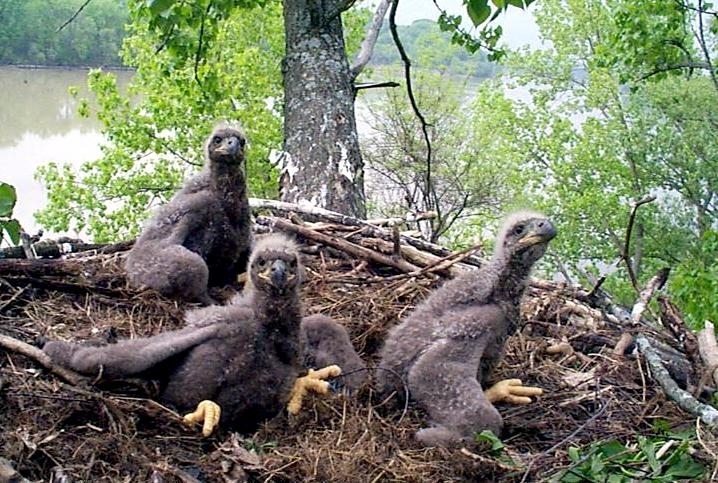 Young Bald Eagles fledge after 12 weeks and remain with the parents for another month.